I've been on and around water since the beginning of (my) time. My first vessel with a stick was an inner-tube with an umbrella that I fashioned from the swimming tube collection my grand father had at our family's southwestern Michigan cottage. At Hope College I crewed on 32' sailing sloops in the Great Lakes. Life moved on to a geek-hood work life in the new computer tech world (yes I'm comfortable with the moniker "The Old Geek"), marriages, families, 9 years of military duty in Washington, DC, building networks for banks and master gardening in Indianapolis, designing networks for Fortune 100 corporations and sailing with the Alum Creek Sailing Association in Columbus OH. I bought a business for the Admiral to run on Chincoteague Island, VA, so I could get back to sailing after a complete restoration of the C22 hull #940 swing keel, now referred to as "Dragonass." I acquired a USCG Captains License and Virginia Eco-Tour Guide certification to be recognized as credible, and run a small charter called "Captain Ashley's Sailing Adventures." I also move and provide navigation planning for boats moving from NY to FL along the ICW and East Coast including the southwest coast of Florida. 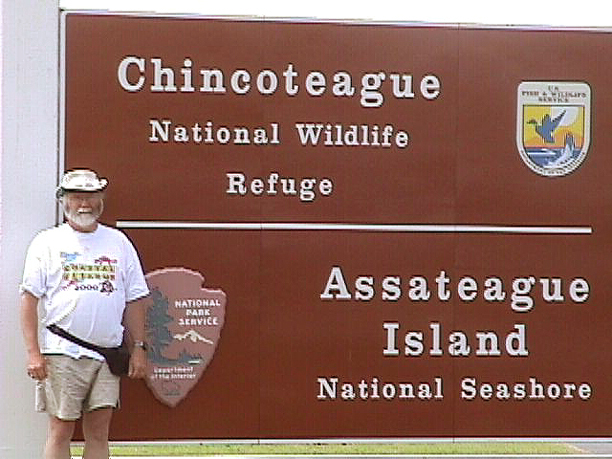 The Captain ("Old Geek") still keeps building networks for Fortune 50 corporations, now as an AT&T engineer, but I work Virtual Office (VO) nowadays from Chincoteague Island. Next life's change is building and outfitting the "MALA-Maru," a yet to be built Gemini 105MC, and moving to Burnt Store Marina, FL! [Jim and wife Carol] I'm new to sailing, tho 56-years old I'm still learning about sailing and restoring my sailboat. I always wanted a sailboat. I saved my money and at the last moment bought a power boat, because my then-wife said she may enjoy it more than a heeling, slow, sailboat that seemed like too much work to really enjoy. So I bought a cabin cruiser instead. 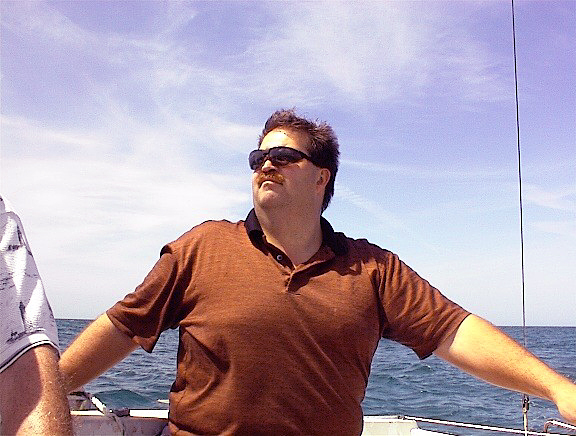 I loved to take to the ocean out of Dana Point Harbor. I'd enjoy the day in my power boat, but long to sail every time I'd see a sailboat on the water, and there were many. Many years and one wife later, I bought a donated Catalina 22 on eBay; a sailboat that was still being dry docked after 24 years of being out of the water. Little did I know that I had bought one of the most popular sailboats of all time. I'm learning to restore it with all of the information I can gather. SPECIAL THANKS to members of Chip Ford's Catalina Discussion List for all of the extremely helpful with information, photos and tips on restoration and improvements. I have many items to repair or replace before I can put her in the water. Then I will learn to sail her. I look forward to the days ahead on Lake Mead and the coast of Southern California maybe even the Sea of Cortez in Mexico. I have lots to learn and do, and I am enjoying every moment, and I haven't even put her in the water yet. My Sincere Thanks To All For You Help. 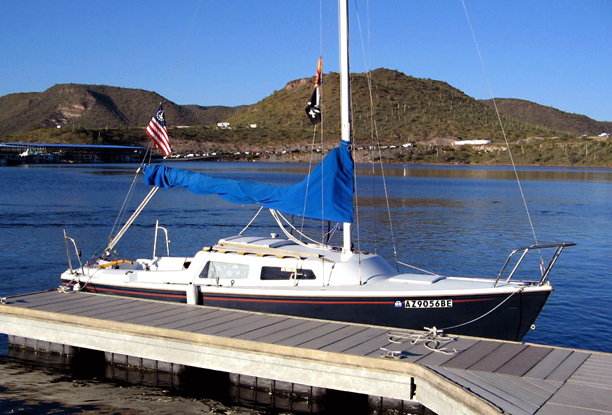 Here is my website for my Catalina 22 - "Sailing Free". I have my dad to thank for my lifelong interest in sailing. 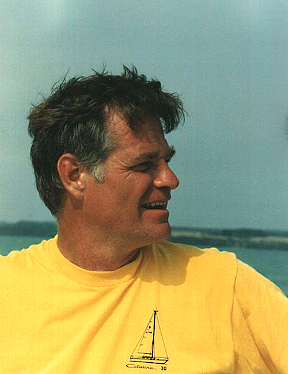 As a young teen he gave me plenty of tiller time aboard Flying Scots and Ensigns on Lake St. Clair and on our Hobie 16 on Lake Huron where I learned to ‘fly a hull’ and perform spectacular capsizes with unsuspecting novice crews. 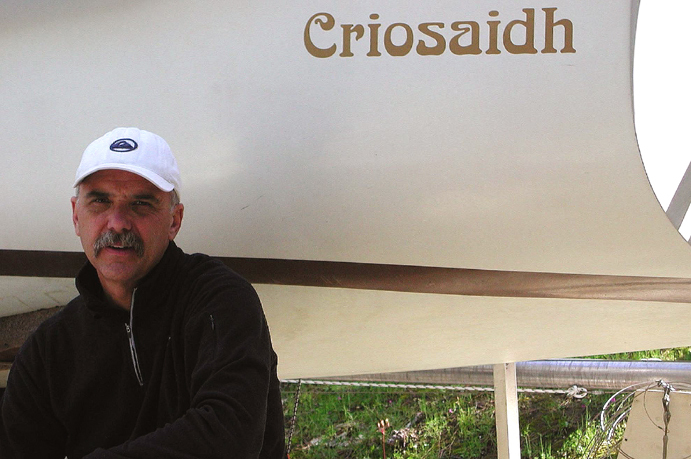 For the next 25 years I hardly sailed, preferring to train and compete in triathlons. 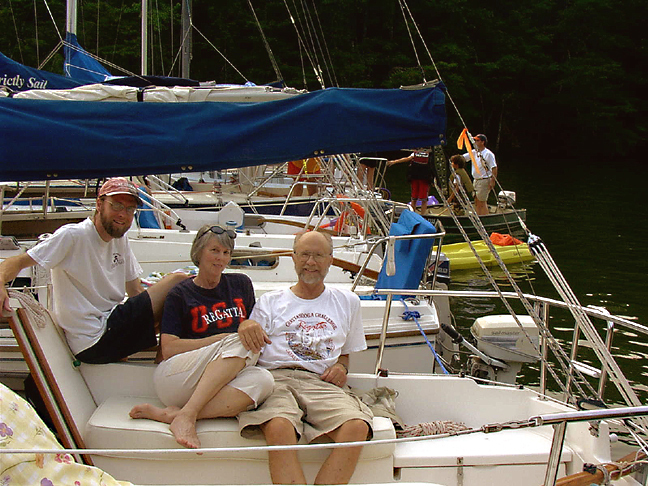 But the sailing bug has returned, this time with our move to northern Michigan. Together with family I’ve chartered twice now on the North Channel with its wilderness islands of pink granite, limestone and quartz. I also developed an affinity for charts, a useful obsession when it comes to dodging submerged rocks. Last summer I crewed in J/105 races and talked my family into a new adventure in the Pacific Northwest. For about the price of a new dinghy and outboard we bareboat chartered a decadent cruising yacht for a week in the San Juan and Gulf Islands – a 2005 Jeanneau SO 49DS: 28,000+ lb., much of it teak, 65 ft. mast, dual helms, bow thrusters, electric winches, and other ‘amenities’. It’s easy to become enamored with these big boats, their complex systems and superlative stats, but they still lack the excitement of small boats. Eventually we decided on the C22 wing keel solution for our local coastal Lake Michigan waters and we can’t wait for the ice flows to melt. Always remember to ‘own small and charter big’! 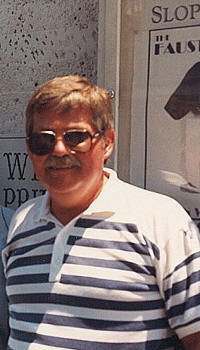 I bought my boat new in 1984 from Sail Away Marine in Miami, FL: I ordered it at the Miami Boat Show as a package. The changeover in hardware for deck fittings, shrouds, and light fixtures happened as the boat was being made. I bought a bimini, genoa, VHF radio and covers the first year. We moved to Tennessee in 1990 due to job change. I thought that I'd never sail again, but fresh water lake sailing turned into a wonderful change. Eat lunch on shore and go sailing. It's much different than ocean sailing. I sail year round including in snow. (like being in a wind test tunnel). My wife Jennifer and I had the good fortune of living on North Carolna's Intercoastal Waterway for our first six years of marriage. During that time we played in the sound with small motor boats. However, one of our neighbors would take us sailing on his twin keel Westerly 28(?) from time to time, and I was hooked. 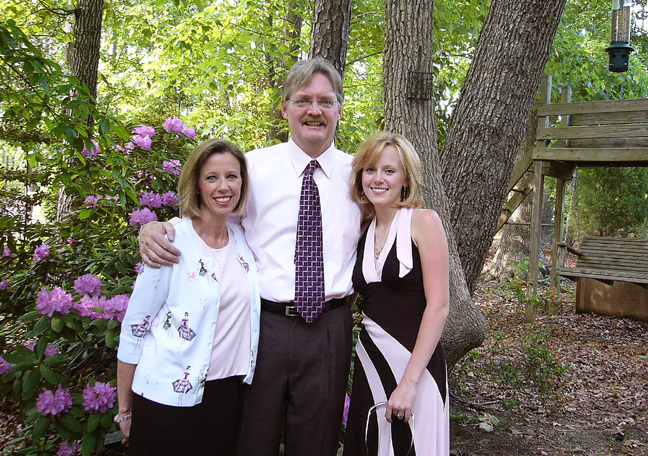 In 1986 we were blessed with the birth of our daughter, Meredith, and moved from Carolina Beach to Cary, NC in 1987. About a year later we sold our motor boat, which was generally only moved when I needed to mow around it. 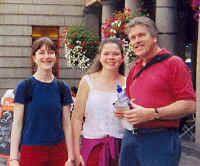 The picture (left) was taken of Jennifer, Meredith and me on the day of my graduation from Duke Divinity School in 2005. I went back to school to answer the call of God to become a second-career minister, or as a really radical mid-life crisis. Just prior to graduation, Jennifer asked me, "Now that you are finished with your MDiv, what would you like to do for you, even if it does not make sense?" Well, we named my next mid-life crisis "Mer-Sea," based on the meaning of Meredith's name (from the sea), the French word, "merci", and the fact that none of this would be possible without the "mercy" and grace of God. I bought the boat sight unseen, brought it home in early June and finally had it under sail in late August, thanks to the folks on this list. My father enjoyed building, sailing and repairing wooden boats and I was fortunate to spend many days with him in boats and boat yards. 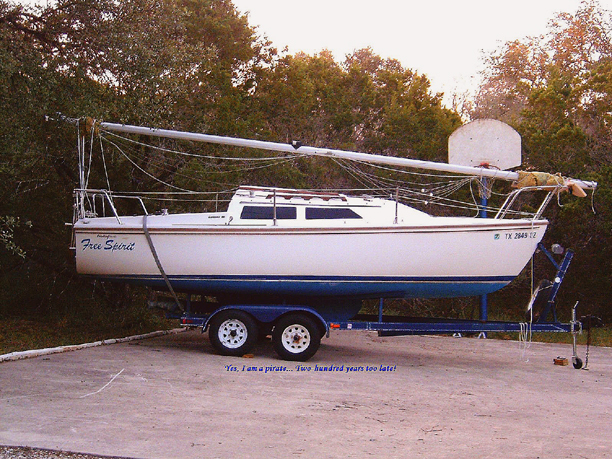 My first boat at age 14 was a sailing pram, followed later by a Sunfish, Blue Jay and GP14. 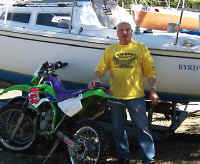 I have raced and cruised with my GP14 on the lakes, rivers and bays of South Jersey for over ten years. Many wonderful times! 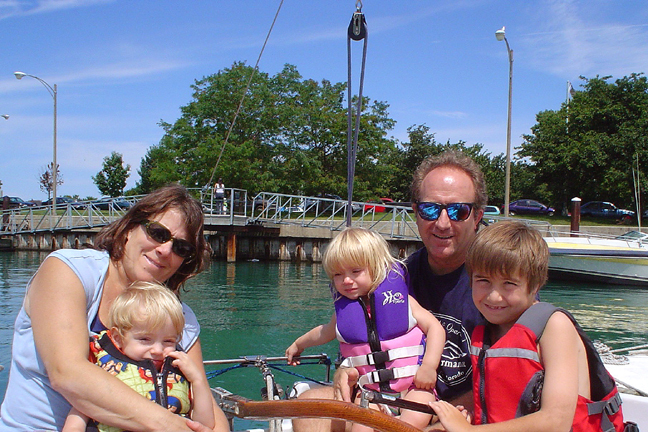 I’ve been fortunate to have introduced my wife, children, and many others to sailing. After completing several Power Squadron and ASA courses, and a few charters, I was ready to move up to a larger boat; one that would sail well, be raceable, trailerable and comfortable to sleep on. The Catalina 22 matched my requirements and when I found this restored boat I knew it would be unlikely to find an older boat in such fine condition. I bought her, sailed her, and find I can handle her just like a small boat. A dream come true! 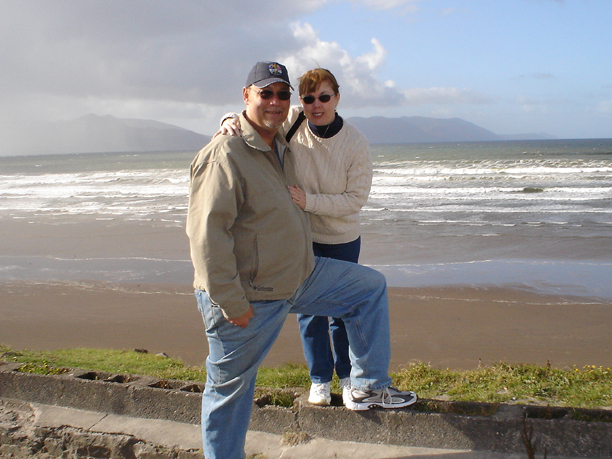 My wife Rose and I grew up in Brooklyn, have been married for over 30 years, have two fine children, own a house in South Jersey, enjoy kickboxing, bicycling, dancing and occasionally camp and canoe. I served in the U.S. Navy, worked in the shipbuilding industry, and currently at age 50, work at the United States Mint Philadelphia. We're looking forward to traveling with our C22 to different locations for both cruising and racing. 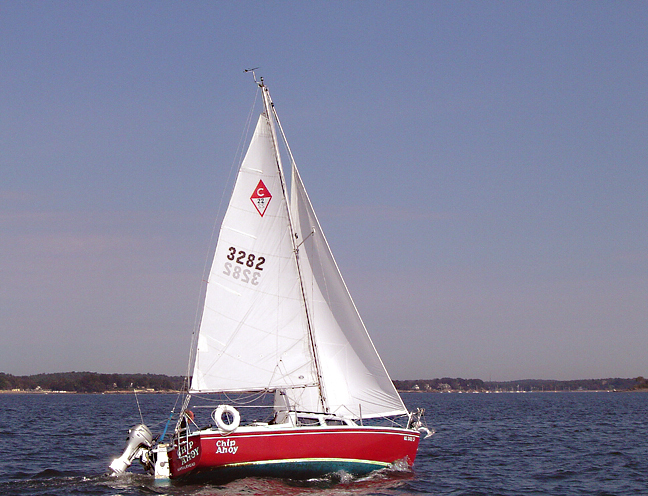 The first time I went sailing, a friend's farther turned me loose on a Snipe (or Snark). 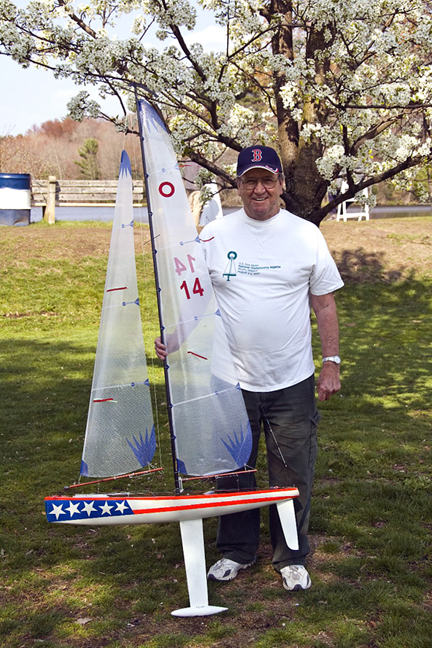 A wooden day sailor with a giant metal center board. I did fine until he asked me to take out a friend of his – an adult (I was 16). I capsized the boat and didn't sail again until I was in my 20s. That time I took my wife out in a rented sail boat and did okay in light winds until it came time to return to the dock. I rammed it head-on much to everybody's chagrin. Years later my son got interested in sailing and, through no fault of mine, I wound up taking a keel boat sailing course with him. This turned out to be the 'right' way to go sailing and I go hooked. One Flying Junior later, I bought the C22. That was in 2002. 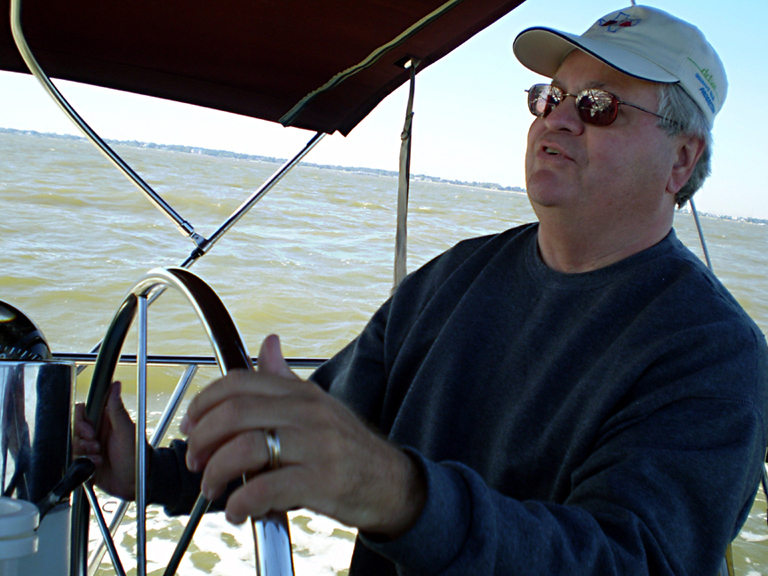 The picture was taken by a friend at the helm of "Selkie," reaching down Lake Rathbun in October. The white birds are terns that migrate through every year. A Selkie is a Celtic mythical beast that looks like a seal and can transform itself into a human when it sheds it's skin. If you hide the skin it can't return to the sea. Remember that the next time you see one. For the last couple of summers I've crewed on a local boat for the Tuesday evening races held by the Astoria Yacht Club. This spring I mentioned to a friend I hadn't seen for a while that I'd be crewing, knowing he also had in the past. During the conversation he mentioned that he was selling his '72 Catalina 22, having bought an '81. Well, I bought it and with a little work I've had it in the water since late July, moored at the Astoria West Mooring Basin at the mouth of the Columbia River. Thus this has become my training grounds with my first boat. I grew up on the north coast of Oregon; lived in Portland for a few years before moving to the Chicago area at 23. 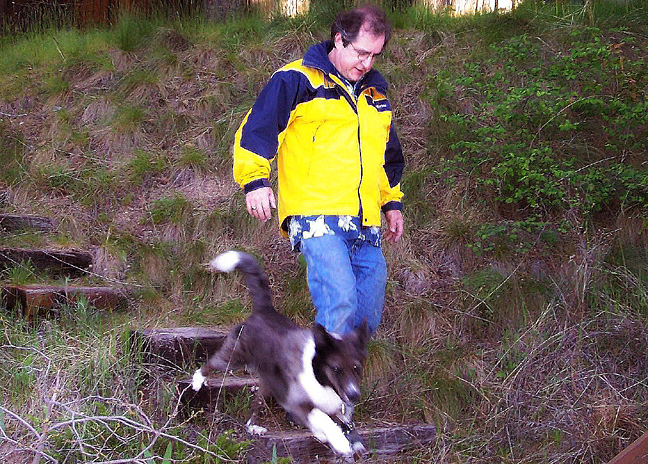 I worked in the power tool service business; at age 37 moved back to the Oregon coast and opened my own tool business. After 10 years I closed the business, became a grounds keeper, and at 54 am starting again in home maintenance and remodeling along with my girlfriend Sandy, who also happens to be an accomplished sailor. I enjoy surfing and skiing. As a holiday gift to myself this year I've just bought a float home just outside of Astoria off the Columbia River. I'll get to park "TomCat22" at my front door! I started sailing in 1975 on a friend's Dolphin Senior, and got hooked. I then bought a Viper 16, followed by a Balboa 20, Hunter 25, Montego 20, Holder 14, Spindrift 22, Ericson 27, then the Catalina 22. I raced the Balboa and the Hunter back in the 80’s but now only race in an occasional beer can. 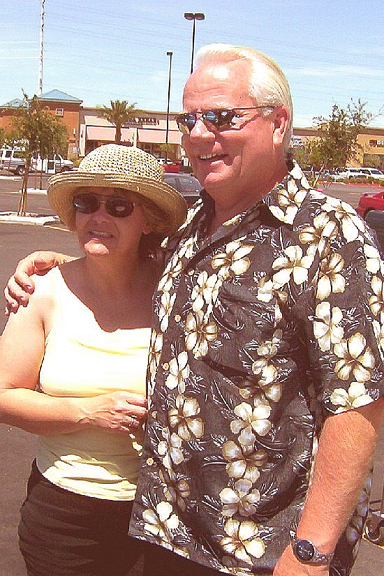 My wife Krin and I are both retired, she with the Postal Service as a postmaster and me with the FAA as an electronics technician. Between us we have 5 kids and 12 grandkids. Our home is right at Canyon Lake in South Central Texas. “Byrd's Nest” is kept in a slip at the local yacht club (LCYC) which is 10 minutes away. Very convenient. 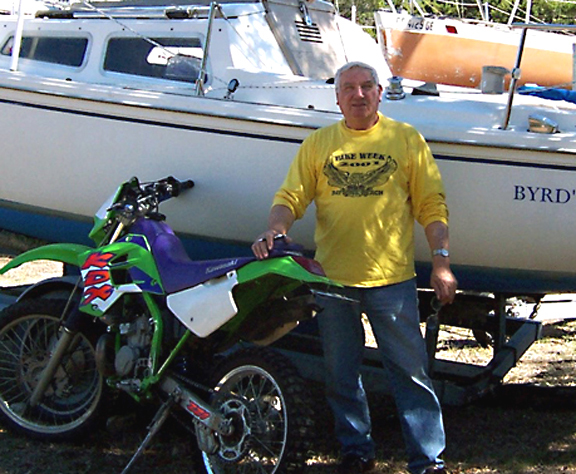 I’m 71 years young and my other sport/hobby is riding motorcycles. Don't do much road riding anymore but still trailer the dirt bikes to Colorado to ride in the cool mountains around Ouray when it is too hot here in Texas in July and August. 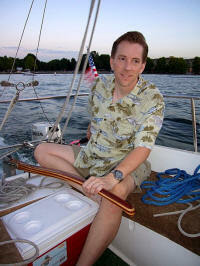 My first experience on a sail boat was as a crew member aboard a 70’ racer on Lake Michigan. I was invited to crew with my then brother-in-law on his father’s boat, Wind Dancer V. I was rail meat the whole time but was allowed to pound out, what seemed like hours, on a winch. A lot of work but it was the most exciting thing I'd done. The boat's heeling was frightening but exhilarating too and I became addicted. My sail experiences were few and far between. Years later I planned to take a 5-day ASA course in San Diego. The cost was $2,100. A few weeks before making my reservation I found a 1969 Venture 17’ for sale for $2,300. 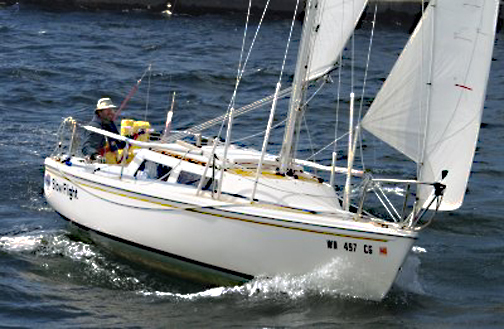 I decided to instead buy it and learn to sail on my own boat; paid the owner for private lessons. Within months I upgraded to a 1978 Balboa 21. I sailed it a handful of times, made many friends at the lake, but was going through a divorce. I decided to upgrade to a 1982 Catalina 25’ and live aboard, did so for almost a year. Weekends with my kids aboard was a blast and they fell in love with the life. After a few years I found my real soul-mate and we moved in together. Fewer nights on the lake and more camping trips to fresh water lakes prompted me to sell the C25 for its little trailerable sister, my Catalina 22. Growing up, my summers were spent on the coast of southern Massachusetts. 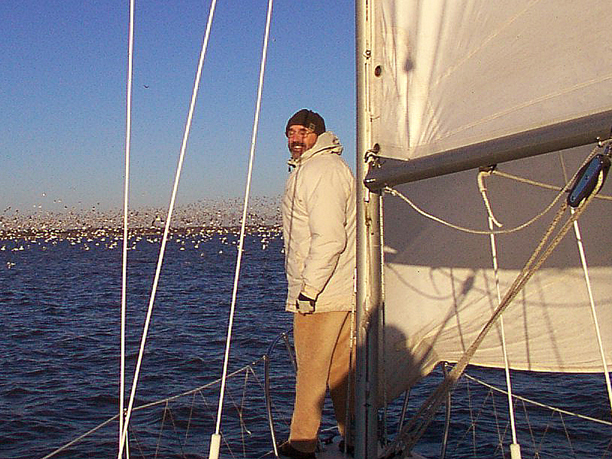 A move to the Midwest in 1990 eventually ended my sailing for nearly seven years until 2003, when a Sunfish bought for our teenagers brought it all back. My Catalina 22, "Reminisce," was purchased in August of 2006 and now finally I can sail with my wife, Deb, (she just wasn't comfortable on the wet Sunfish). With a trailer, Reminisce will let me again sail Buzzards Bay (an annual summer migration) when it's too hot, too windless in south central Illinois. My first sail was at age 4 in a rented One-Ten off Marblehead, MA with my dad. 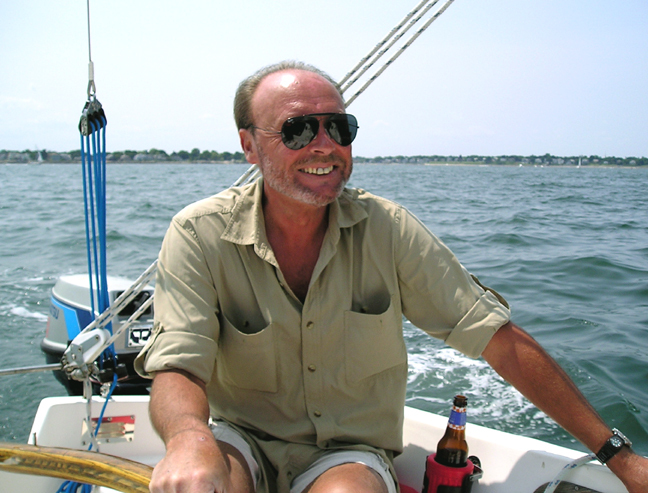 I grew up sailing with him on Buzzards Bay. 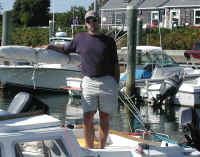 I raced Jet 14's, a Cape Cod Gemini, a Cal 20, and a Cal T2 (half ton). 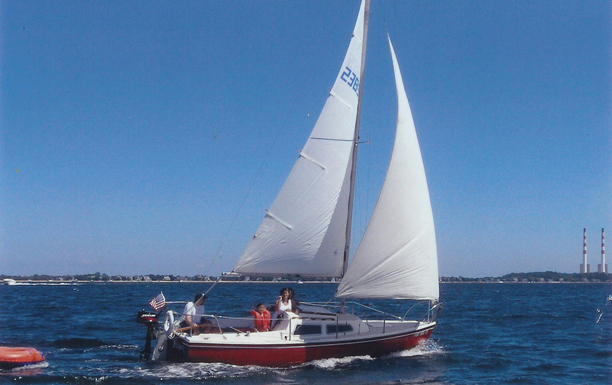 With a new family in my 20's, 30's and early 40's, I cruised the Cape Cod Islands with a Cape Dory 25 and then a CD 26. I pay the bills as a hospital administrator and consultant, commuting 75 miles to St. Louis. My wife and I live in Nashville, IL, a community of 3,000. Our slip at Carlyle Lake is just 20 minutes away. I was born and raised in New Jersey, just outside of NYC. I joined the US Air Force in 1981, right out of high school and spent time in CA, AK and finally here in AZ where I stayed. I used to summer during my teens with grandma in St Petersburg, Florida, and spent all my afternoons walking the Clearwater marina and others. I liked all boats, but loved the sailboats -- stared at them, took pictures with my 126 Instamatic, etc. I didn't act on it until last year. During the cold, miserable winter here in AZ (NOT), I decided to take sailing lessons and see if it was as good as it looked. I took the ASA101 course in San Diego, and the hook was/is set. I came back to Phoenix where a friend who races in the local yacht club pointed me in the direction of a C22 for sale -- cheap. He looked it over with me, and gave it a solid thumbs up. 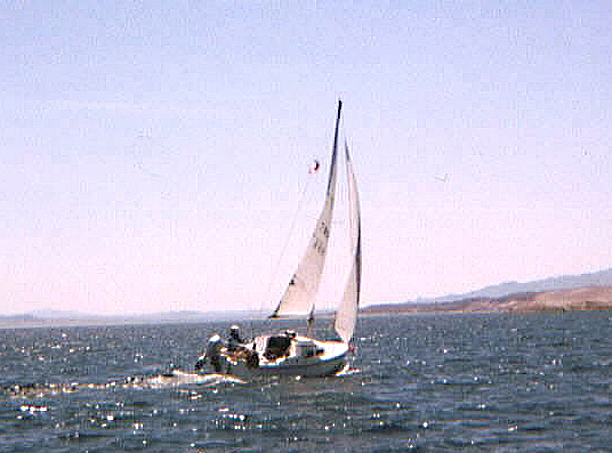 Now I have “Sting” on the hard at Lake Pleasant, and I sail when I can find the time, which is not often enough. So, I am a neophyte, but very excited! I’ve been passionate about boats all my life (I turned 50 last year). I was born in Australia but moved to the US in the late ‘50s with my parents. I grew up in Northern California, went to school and university there, and returned to Australia 25 years later in the early 80’s with my new bride. While at university, I used to hang out at Pete’s Harbour in Redwood City at a time when charter companies were just getting popular. 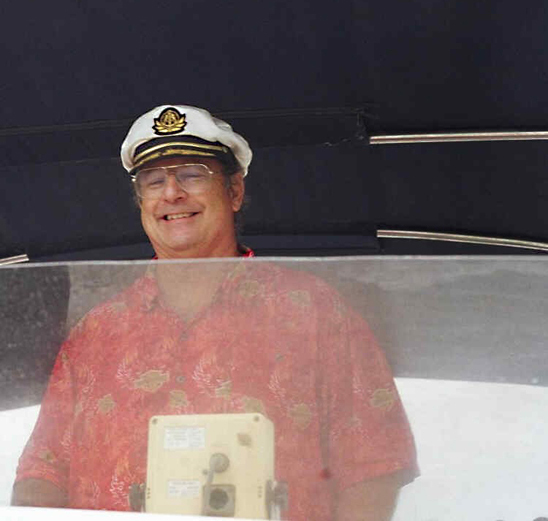 I started chartering from a local proprietor’s fleet, and eventually convinced the owner I knew enough about sailing to teach people how to sail. This meant I got free use of boats ranging from Ericson 23s to a Pearson 35 ketch and often sailed up to five to six times a week for about a year. After moving to Australia, I didn’t get back into sailing until my daughters (photo left) were in their teens. I was impressed with the looks and build quality of the new-style Catalina 22, and when one came on the market here in 1999, it was love at first sight. With only half a dozen in the country, the Internet discussion groups have been invaluable, and I’ve made lots of friends around the world through my participation in them. 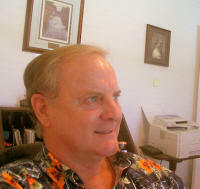 I recently retired at age 60 from the commercial insurance business. I "got out of Dodge" and moved to the small town of Titusville on the east coast of Florida. I've been sailing since age 7 off and on all my life. It must be love! I have three children, Amanda, Michael, and Brian, all happy and successful in their own lives. Titusville is next to Kennedy Space Center, so I get to watch every shuttle launch from my backyard or boat. My sailing area lately has been on the Indian River Lagoon, which is part of the Intracoastal Waterway, or ocean sailing out beyond the Port Canaveral Locks -- my choice based on the prevailing conditions. I can still see a sky full of stars due to the lack of sprawl in the area, please stay home! I began sailing as a kid with my dad in our styrofoam Snark and then a Sunfish. In Navy ROTC, we sailed Fireballs and Lasers. In the Navy, I fell in love with being at sea and dreamt of a future where I could sail across the Pacific… only this time I would be the Captain! My (now-ex) wife and I wanted a fun hobby. That is when we discovered C-22s. Found my boat on Boat Trader and drove to Wilmington, NC over a weekend to go and get her. I have loved her ever since. Due to the flexibility of my job, within the next three years I plan to be living on a 40'+ blue water cruiser, working towards my USCG OUPV license. 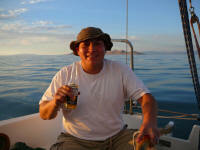 From there, with a friend, I would like to buy a larger boat and start a charter business. If that does not happen, then my 40'+ boat will take us across the Pacific and around the world. 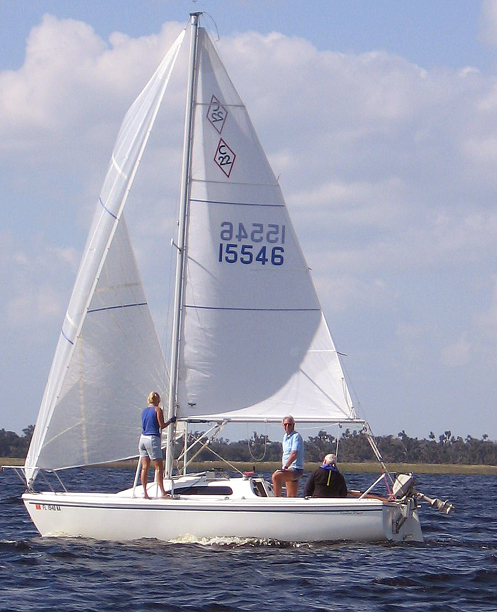 I bought my first sail boat, a 17' Tanzer, about 12 years ago. The boat was moored in Pleasant Bay on Cape Cod, and the previous owner suggested that I join the little yacht club (shack) that he was a member of. Pleasant Bay is aptly named - few power boats, very picturesque, warm, and sandy bottom. I taught myself to sail, and grew to love it. There were some interesting experiences with the self taught method, like the first time I cast-off and realized I hadn't installed the rudder, but I have so far survived the experiences. The Tanzer had an aluminum centerboard (no weight) and consequently was a bit tender, which my wife Mary wasn't happy about, and did not have a motor. I upgraded to a 1976 C22 last season, and we really enjoy it. It came with a 2002 15 hp Honda, and, much to the chagrin of the racers on this list, I'm not intending to replace it anytime soon. The boat is in very good shape for it's age, and I'm hoping to start with some upgrades this spring as the budget allows. I've got two grandsons that I'm looking forward to introducing to sailing when they get a little older. In “real” life, I'm an engineer and have been working in the power plant business for the past 25 years. There is nothing in my background to explain it, but I think I am hooked on sailing. I didn't grow up on or near boats or the water, but a few years back I started sailing on a friend's C22 and I can't get out on the water enough now. I still don't own a boat, but I'm starting to do more of the maintenance on Priceless and that makes it feel like mine. My day job involves computers and math, so keeping Priceless in working order (I can't say ship-shape and Bristol fashion) is a fun and challenging diversion. 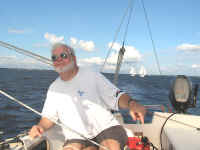 We sail Priceless on the Chesapeake out of Rose Haven, MD, 10 miles south of Annapolis. So far, we've stuck to day sailing (OK and one pseudo-accidental night sail), but I think an overnight or two is just over the horizon. I've also been trying to learn more about sailing in general by racing (crewing on a J/30) and taking some sailing courses. My wife and kids have proven immune to the sailing bug, but it's only been a few years. If they start to weaken I hope to bareboat charter in some interesting places. If not, I'll keep looking forward to my next day on the Bay. I was raised in San Marino, CA and while growing up made many trips to Balboa during the summer. There I was introduced to sailing and a little blunt nosed Balboa Dingy. One summer I worked at the Boy Scout camp on Catalina Island where I whetted my appetite for the water and sailing even more. After high school and a year of college I joined the Navy and served aboard the Destroyer Dennis J. Buckley DDR808. 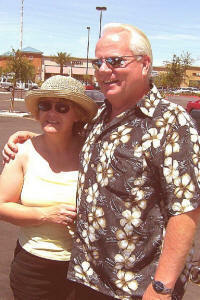 Upon discharge in 1963, I met and married my first wife. I completed my AA in electronics and we went about raising a family; there was no time or money for sailing. My employer, IBM, had plans for me and we moved from CA to Houston, TX for 4 years, then to Kingston, NY for another four. In 1982 we moved to Vestal, NY. Life started to be stable enough to look for a sailboat. I purchased my first C22 swing keel, #10922, and named it “Raindrop.” We sailed Cayuga Lake, one of the Finger Lakes, and Lake George in the Adirondacks. 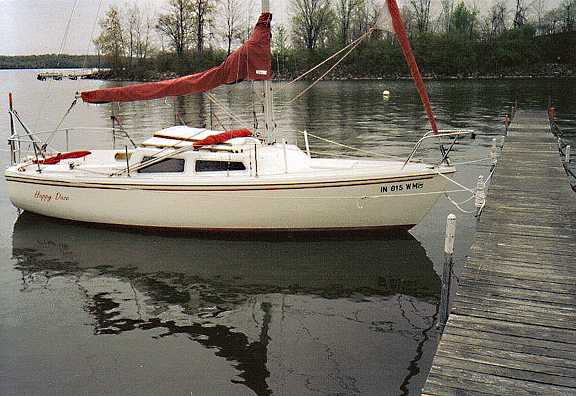 I sold it in 1987 and purchased a C30, which we kept on Cayuga Lake. In 1989 I went through a divorce but kept the boat, met my second wife, Kathy, and was introduced to racing -- what a blast! 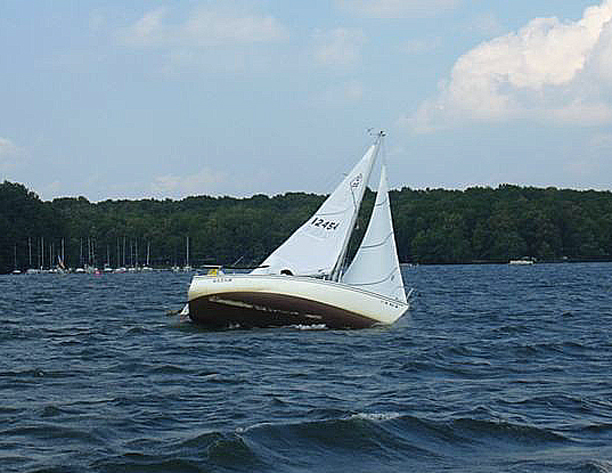 I raced in a non-spinnaker (E) fleet on Cayuga Lake with the Cayuga Lake Cruising Fleet. 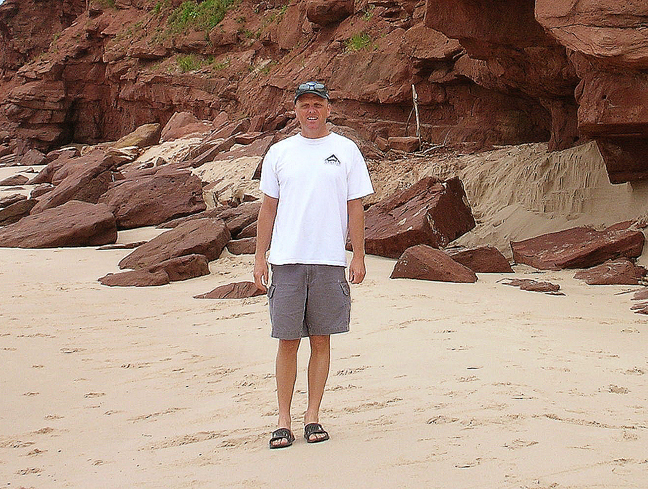 In 1993, life changed as my employer went through a downsizing and I decided to retire. The cost of floating and storing the C30 was too much for my downsized budget while trying to pay for my son's college education. At the end of the season I sold it and have missed sailing these past 13 years. I'm a video producer and director in the Atlanta area, developing marketing and commercials for a wide range of clients around the country. I've worked the Super Bowl for the last 5 years and also have developed movies for the video game industry. I'm a diver and have a lot of experience with underwater video. I also teach martial arts around the country from time to time. It's just a hobby, but one I have been doing for decades. I had a great teacher, who taught some famous martial artists. After he died, many of them have encouraged me to continue to teach his art and help preserve it. I started sailing in Miami when I took lessons at a school there in 1994. I was renting so many boats that it made sense to buy one. I've always loved the outdoors; have backpacked many times when I was younger; sailing on the ocean was something else I wanted to do. I'm not into racing, though I've had fun doing it. Mostly, I love being out on the water, with good wind and plenty of time. This is the first boat I've ever owned and have never sailed before I bought. My wife Melissa however sailed on the Marquette sailing team in college and her knowledge has been life saving. I'm totally hooked and can’t get enough. I have a lot to learn yet and am looking forward to it. I'm 41 and my wife is 32. She's an engineer for an electronics firm in San Antonio; I was a machinist for 22 years. I'm originally from Colorado, but we've lived in Texas now for almost 10 years. My wife is from Chicago. I have two children from a previous marriage. My daughter, 14, lives with her mom in Colorado, and my son, 22, left the University of Texas at Austin to chase his girlfriend and now lives in Denver where they're both working and going to school. So we now have a house that is too big and a boat instead of a pony! All you locals give us a shout if you see us out and about. I'm using the Uniden “Mystic” on my VHF. If someone asked me just a few years ago if I would be interested in sailing I would have looked at them like they had three heads! I spent half my childhood in the South Bronx where our “regattas” consisted of little rafts made from ice cream sticks and little paper sails that we used to race along the gutters when the fire hydrants were open. My goal in life was to get out of there and I did because I was luckier than most of my friends. The rest of my childhood was lived out in Brandon, Vermont. I lived and worked on a dairy farm. Thirty-five years, three children, and seven grandchildren later I thank God that when so much could have gone wrong it didn’t. In recent years I have sought a closer relationship with God and entered formation studies. While studying creation spirituality and the elements of fire, water, air and wind we were challenged to find deeper ways to commune with these gifts we take for granted. After much thought, prayer and studying it occurred to me that sailing was the perfect venue to place myself within those very elements and really experience their presence, power and effect on my life. “Ruah” which is the ancient Hebrew word describing the spirit breath of God. “Ruah” is the ancient Hebrew word describing the spirit breath of God. The link below explains my inspiration for the name. After two decades back on land, I bought “Chip Ahoy” in late-2002. Throughout this website you’ll see the labor (and money) I’ve poured into it since. I’m a cruising sailor, not a racer. 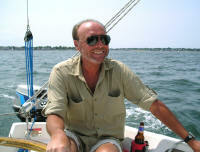 I sail mostly off the North Shore coast but occasionally across Massachusetts Bay down along the South Shore. Each summer I take an extended, singlehanded cruise for 2-3 weeks, the high point of my year. C22s have become such a big part of my life that, after this website was established, I added the new discussion group list in 2004. I served in the U.S. Army from 1969-‘71 then attended Mass. College of Art as an illustration major. I gave that up in my senior year to go sailing aboard “Even Song,” a 1928 wooden 48’ ketch friends and I had restored -- which was followed by restoration of other big old wooden boats and a cruise down the Eastern seaboard to the Florida Keys and back. During my 5-year live-aboard period, I made my living as a sign-painter mostly lettering boats, often up and down the East Coast during extended cruising. I am new to sailing and my 1989 Catalina 22 wing keel. I grew up on Long Island Sound in Stratford, CT, but we never had a boat. 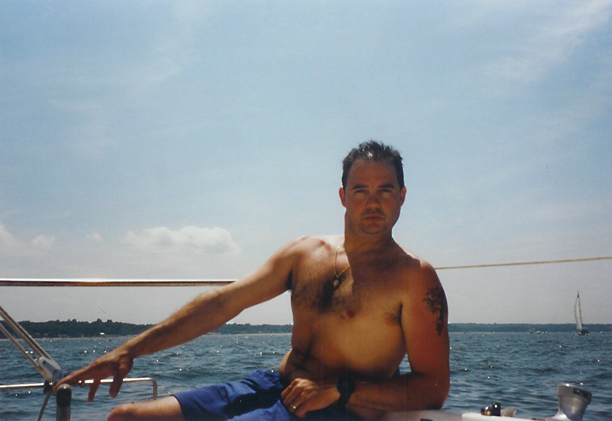 During college my (future) wife and I spent time aboard my roommate's family 30+ foot powerboat. 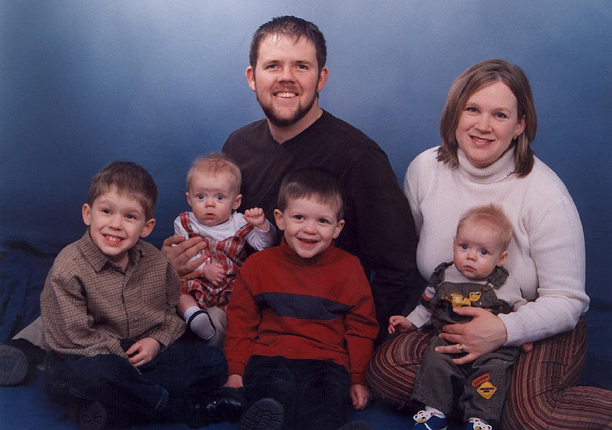 We (my wife and four kids) became Midwesterners 15 years ago. I am a private pilot and mission pilot for the Civil Air Patrol (USAF Auxiliary), but flying never became the family activity I hoped it would. PuddleJumper is my next attempt. My wife and I both are UCONN 1988 grads (go Huskies) and would like to go back to Connecticut once the kids are out of the house/school. My oldest is a freshman at Ohio State University but I am still anti-buckeye. My youngest is 10, so I still have a few years to go in Ohio. I'm 63 years old and retired. I've had many hobbies and interests through the years: ham radio, SCCA road racing, USAC midget racing, cruiser sailing, golf and hot-rods. For a number of years my first wife and I spent every weekend, in season, living aboard and sailing "Lazy Daze," our Macgregor 25. "Lazy Daze" was moored on Geist Reservoir near Indianapolis. My first wife died at age 47. 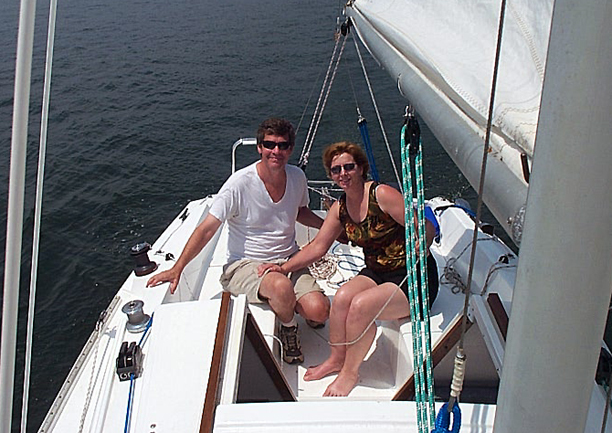 My second wife and I sailed a little the first year we were married. She's too small to crew and was never comfortable at the helm with me on the foredeck attending to things -- sometimes I wasn't so comfy either, hah! The boat wasn't rigged for singlehanding so we sold her. I got into hot-rods and rebuilt one and totally built another one. I drove them all the time and we went to a lot of car shows and cruise-ins. I recently tired of the hot-rodding hobby and decided to go sailing again. Sailing is one of the two most fulfilling hobbies I've had. In December of 2005 I bought "Happy Daze" which I'll be able to singlehand with the Admiral overseeing things. Her new home will be at the Muncie Sailing Club on Prairie Creek Reservoir. There will probably be a few winter trips to the Florida Keys for her in the future also. The Admiral and I are really looking forward to getting back on the water again. Born and raised in northern NJ with a desire to fly large airplanes, I went to a military college in Colorado Springs and graduated with an engineering degree and a ticket in hand for pilot training at Columbus Air Force Base in Mississippi. I flew KC-135s in Georgia, Michigan and Riyadh KSA, and taught flying in Colorado Springs. I hold an Airline Transport Pilot rating with about 4000 hours. After retiring from the Air Force I started work for a company in Kenosha, WI. I did ISO quality system work and was then assigned to supervise a small group doing financial analysis & budgeting. As a child, I learned to sail in a twelve foot Penguin on Maine's Maquoit Bay. That's an inlet north of the great Casco Bay that our fearless leader Chip Ford so bravely sailed upon in summers past. So, how did I get here from there? Physically, by that most ubiquitous mode of transportation, known as the automobile. Spiritually, through an aquatic craft succession of a canoe, a Snark (please don’t laugh), and a wind surfer. Financially, I picked a good stock bought out at a sufficient premium over my basis that allowed me to indulge in that great kings’ pastime known as yachting. Following that, I join the ranks of the poor and humbled masses as I pour copious amounts of ever more funds into that perpetually growing hole in the water without the benefits of previous good fortune that engaged me in the process originally. I started sailing on Lake Sammamish in an old Lido 14 with my dad when I was about 5 years old. I still have the old Lido (sail number 201! 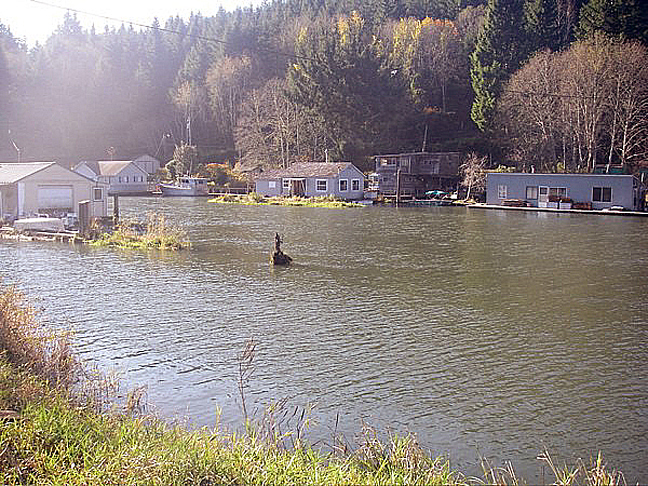 ), but we lost our lake property after 103 years in the family. I think I had to replace the loss of the property with a bigger boat. After searching a while, I found my Catalina 22 from a response to my ad on Craigslist. 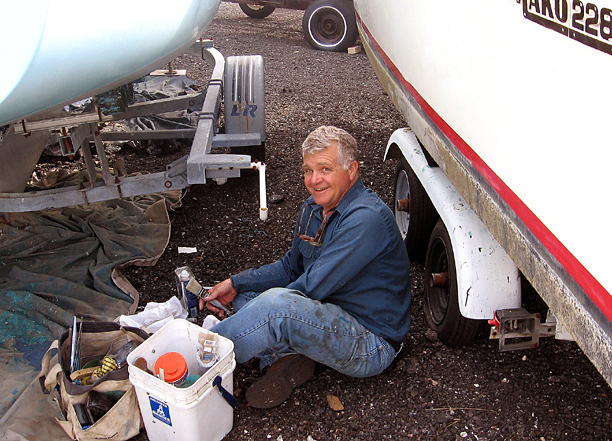 The boat was in good shape, dirty, needed a little work, but otherwise was ready to sail. 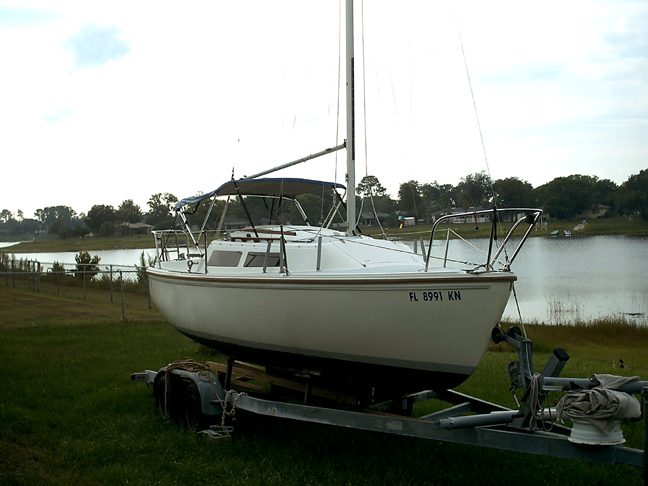 I took it home and have been working on it, and sailing whenever possible. She is now named “Delphinus” - after the constellation of the dolphin in the summer skies. I'm an amateur astronomer as one of my other many hobbies and park Delphinus in my backyard next to my observatory. I've flirted with power boating a little bit, but think my first love in boating is definitely wind powered. Even at a top speed of just over 6 knots in a good wind, it sure feels better than skipping over the water with a greasy, gas sucking, smelly motor pushing you along. Plus, you can drink coffee, listen to music on the stereo and talk with your crew all at the same time while sailing! 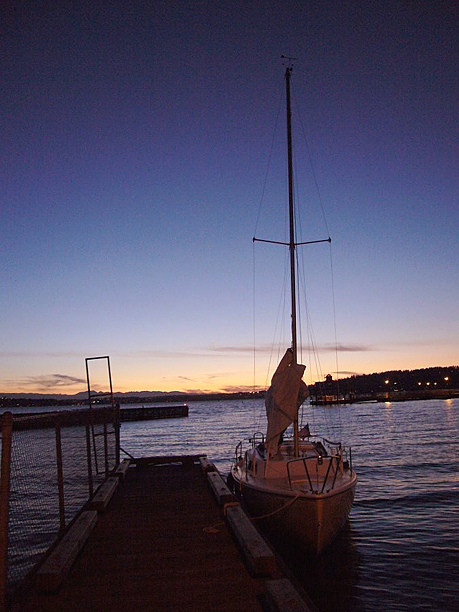 I primarily sail on Lake Washington, but eventually will venture out through the locks to Puget Sound and beyond. I live just a short way from the boat launch. I share my house with my girlfriend, her teenage daughter, 3 cats, 2 rabbits and an occasion rescued animal the girls bring home! I have many hobbies including flying, freelance flight instructor, ham radio, computers, sailing (of course), scuba diving, astronomy, and collecting autographs from famous astronauts and pilots. 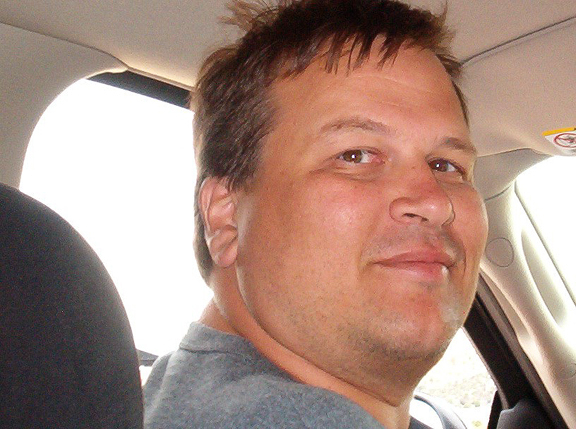 I work as a system administrator for a small, but growing, internet company in Seattle. In 1962 (I was 4-years old) we moved to Tennessee. My dad went out to buy a fishing boat and came home with a Flying Junior sailboat; mom was not happy. When 9 I entered my first Sunfish race. There wasn’t much wind and the 13-year old that owned the boat wanted to swim instead of sail. So I went solo. Knowing little about racing, dad just said to follow the Thistle fleet and do what they do. I did and I won the race, my 45 pounds in 0-1 knot of wind equally contributed to my victory. And I haven’t stopped racing since. In the mid-70’s we added a C22, “L’Hayim,” to our family fleet. In 1984 dad invited me to skipper L’Hayim in the 1984 Nationals and I was hooked. Sailing the Nationals became an annual trip for dad and me. We’ve done many over the years: Grapevine, Tahoe, Idaho, Baltimore, NY – best placing being 2nd in 1991 at Buffalo. We won the 2003 & 2004 Midwinters and many times were Region 4 champs (including 2006). Living in Chicago has its pluses and minuses. 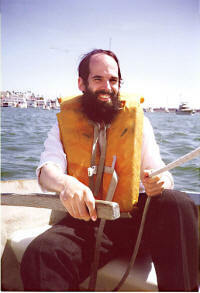 We keep L’Hayim in a nearby harbor. I can leave my house and be out of the harbor in less then 30 minutes. Cruising with the 3 kids on the Chicago lakefront is fantastic. But to pull the boat to go to an out-of-town regatta is a 4-hour ordeal. So we have a second C22, “Chutzpah,” we keep on a trailer: on Friday we hook up and go and Sunday night return her. I'm also an advisor to the C22 National organization. If you ever find yourself heading to Chicago, pack your shorts and sailing gloves. L’Hayim is sitting in Montrose Harbor wanting for you to take her out. 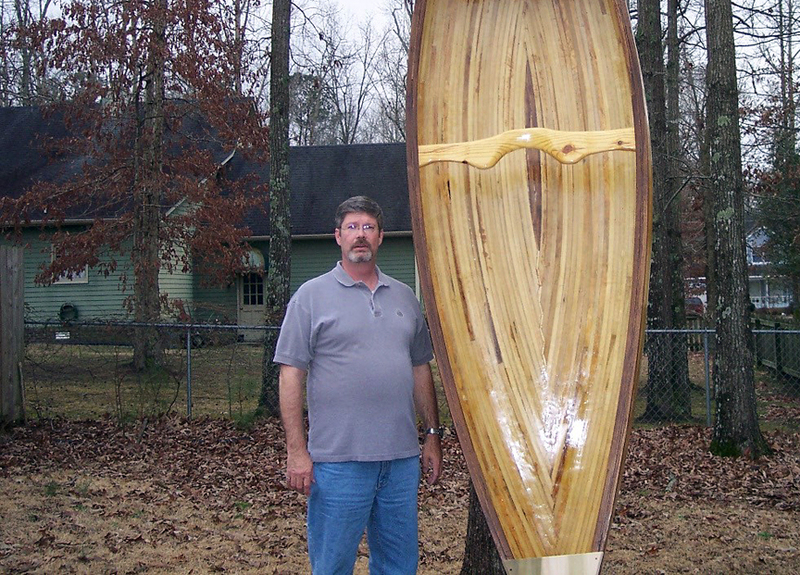 When I was a boy my father built a wooden sailboat about 8 feet in length. My mother made a beautiful blue and white sail. We got the mast off of an old iceboat and put in at a northern New Jersey lake we camped at each summer. There my love for sailing began. Not many years later I moved to Florida to go to college. On occasion I made it down to the Keys and sailed a wooden 10 footer close to shore, usually out to snorkel off by myself. One time I sailed the love of my life in a sunfish with the promise I wouldn't flip her over. You can guess what happened. I rescued her and soon after that she married me. Nineteen years of marriage and three kids later Chris probably thought I forgot about sailing. 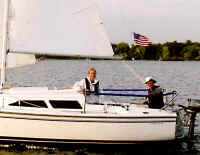 Then in the spring of 2006 I purchased my first sailboat, a 1980 C22. By the fall of 2006 Chris has yet to get onboard. She wants to make sure I know what I'm doing first. My two boys and I are learning this together. My other interests are astronomy, saltwater aquarium-keeping and computing, though Chris will tell you I have many other hobbies. I work at Kennedy Space Center and cruise the Indian River Lagoon. 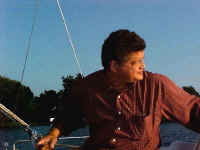 My wife, Linda, and I live in a small village on Chesapeake Bay, near Easton, Maryland, sailing on the Miles River and Eastern Bay. We rebuilt our weekend house in 2005 and moved here when I stopped working full time in February 2006. I was a management specialist for the federal government for 41 years, on the team that created the Environmental Protection Agency, later ran the Senior Executive Service personnel system, was director of administration for two large agencies, and ended up in the training and executive development business. 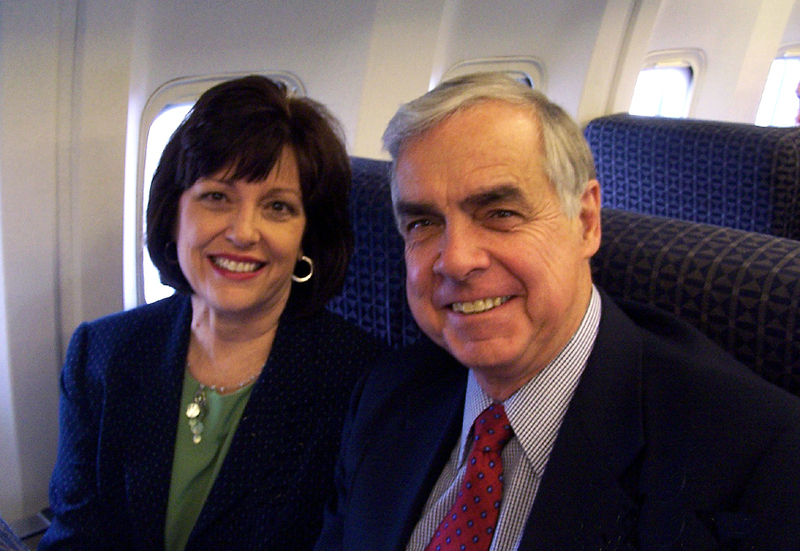 We share our Catalina with Jack and Judy Harrald. 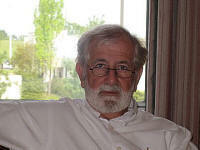 Jack is retired Coast Guard and now teaches security and risk management at George Washington University. Judy works for the Treasury Inspector General. (No IRS jokes around her.) Jack and Judy have sailed all over the world. Lin and I are just learning. I also row and sail a 17’ Whithall. 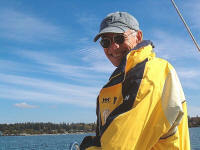 I am 68 years old and just taking up the hobby of sailing after a dozen years of flying light aircraft. This is the first boat I've ever owned and it was very neglected. It took me 9 months to restore it as a racer; I placed it in the water for the first time in the 2007 Mug Race on the St. Johns River. Thanks to my crew, VC-17 bottom paint, and Gus Sails, we took first place in the RCHS Non-Spinnaker class, Division C.
I'm new to sailing and the PO was less than generous to both me and the sailboat. There are a number of upgrades that have been done to the boat but many items are missing. (Eg., holes have been drilled for mast gates but none came with the boat; There is a set of eyes leading down the port rail of the boat but I have no idea what they are for, etc...) I can tell the boat was pampered at one time but has since been badly neglected. My intent is to bring it back to something to be proud of. 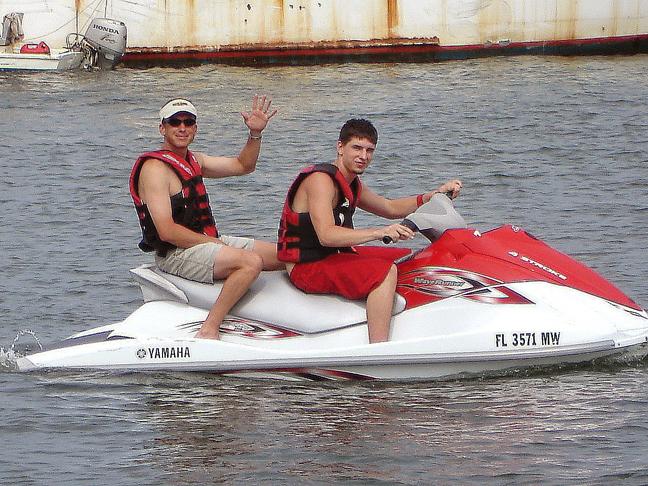 I've included a picture of myself: I'm the one waving on the Jetski sitting behind my nephew. He’s only 19 and couldn’t rent it by himself, and a shot of my project in the water for the first time. I have many questions, especially concerning rigging etc., and trying to determine what is original, what is added, and what is missing. 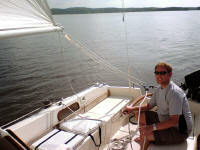 My first sailing experience was August 2003 while I was camping at Lake Ray Roberts with a friend who owns a Hobie 16. I was hooked! In January 2004, I purchased from my aunt her Omega 14, which is now the Capri 14.2. 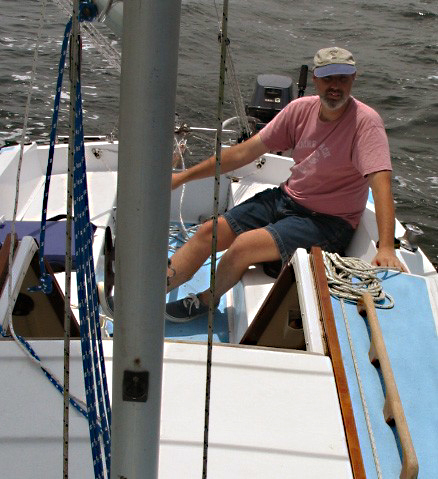 I still own the little centerboard boat, and sail it occasionally. When I purchased her, she was a mess, but I have cleaned her up and enjoy taking her out every now and then. I purchased “C-Monster” (formerly “Mr. Toad’s Wild Ride”), my Catalina 22 sail #359, from a man at Lewisville Lake in April 2004. I've raced in a few regattas, and I try to “humbly brag” that in my first regatta I placed 3rd in a medium size fleet (PHRF). In addition to restoring “C-Monster” so that I may race her in the 2005 Texas C22 Circuit, I love to spend time cruising in the Gulf. I have four friends with whom we have been ASA Bareboat Certified. We have coastal cruised on a Hunter 46 and a Hunter 34 from Corpus Christi to Port Isabel a few times. We go about every 4-5 months. I graduated from Baylor University in 1998 and now work as a financial advisor-tax prep agent-insurance agent during my “spare time.” Most important to me is that I passionately love serving others for Christ through my community and my church: Watermark Community Church in Dallas, Texas. 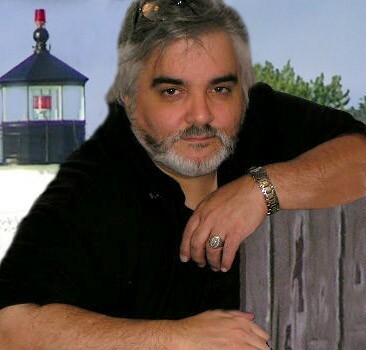 Please visit my web site to discover the significance of sea monsters in my life. My wife Marilyn, (married 40 years) and our two grown children and one grandchild all live in Siloam Springs, Arkansas. I've been at John Brown University for 35 years. I teach physics. We bought our boat about 3 years ago and sail out of the Grand Lake Sail Club near Grove, Oklahoma. As you can tell by the boat's name I enjoy reading fantasy novels. 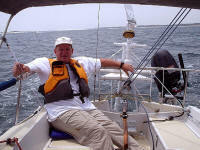 I am a couple of years away from retirement and looking forward to having more time for sailing. I've always been drawn to the water. As a baby, it was bathtubs. As a 10-year old, it was a small creek and a stick in hand, only to watch it float down and away. As a teen it was water skiing and scuba diving on the local lakes. 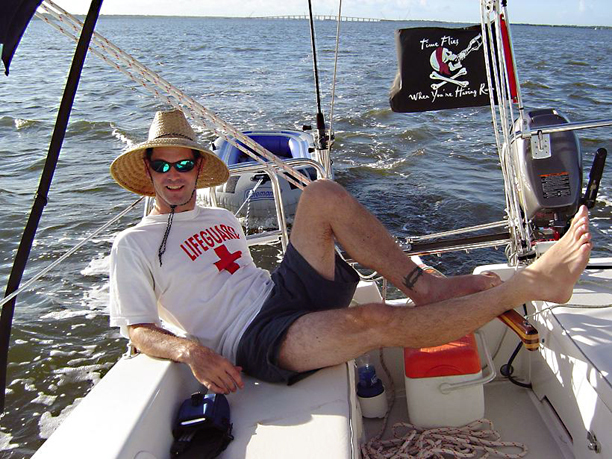 In my early twenties, I wanted to sail and, as luck would have it, an opportunity was bestowed to help crew a 50-foot ketch to Tampa, Florida. But as fate would have it, two days out and seasickness overcame me; I bailed from the adventure. Regret number one. Years went by and life went on, but still I thought of sailing. I knew that one day I would attempt it again. Four years ago that day arrived: I bought my current boat, CjAndeai. The name is a reflection of my loving family, C for my wife, Christine; j for myself; An for my daughter, Andasia; de for my older son Devon, and; ai is for my young boy Aidan. I've been lucky in life, and have had the ability and confidence to work at various jobs which have piqued my interest. I'm currently a commercial HVAC installer. I still don't know what I want to do when I grow up, though, and hopefully never will! I began sailing when my uncle bought a boat he kept on Long Island Sound, and my father (10 years in the Merchant Marine as a radio officer; no stranger to the North Atlantic at its worst) took me along with them. Eventually I caught the bug, but school, work and my family forced sailing onto a cold back burner until last year. Then I was lucky enough to get a '72 C22 on eBay. I drove to Maine and back in 24 hours to get it home. Six months later, after discovering ZEP, YamAmaY (HIN #769) is looking very nice. I'm hoping to get her on the water by Oct., 2006 if only for a brief start. I'll have the winter to spruce her up before the coming spring sailing season. I'm a network consultant by profession, a jazz guitarist by avocation: I'm sure sailing will open new vistas in my life (and my wallet). The name of the boat would take way too long to explain, but it does have the grammatical feature of being a palindrome - a word that is spelled the same in either direction. My English teacher would be thrilled. I'm pretty thrilled myself to be a member of the list, having already benefited so much from it, and looking forward to being a meaningful contributor as my experience builds. I grew up living alongside the Indian River in Cocoa, FL. 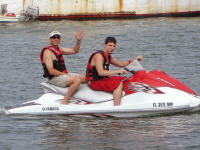 Water sports such as surfing, swimming, and sailing were all part of teenage years. 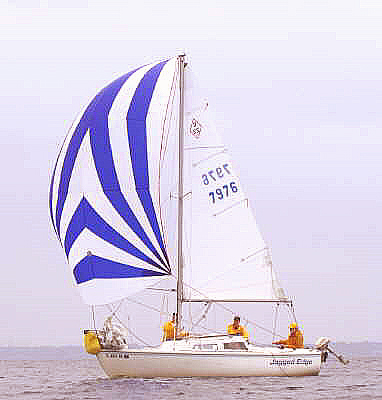 My father had a 28’ Irwin and I spent weekends in the spring sailing races up and down the Indian River. After much effort and a year at prep-school, I was accepted at the Naval Academy, Class of 1980. During the spring of my plebe year, I was accepted to join a group of midshipmen to crew an 82’ Herreshoff schooner "Mistral." This 1939 grand lady took us on a transatlantic voyage to England, France, Madiera and Bermuda. We were at sea for 90 days and logged 9,322 miles. Finishing up my years at the Academy, I raced on "Patriot," a Farris 44’, during the summers in the waters off Newport, RI. My senior year we raced Luders yawls. I was in the Navy for 6 years. My wife, Liza, and I moved back to Pensacola, FL. 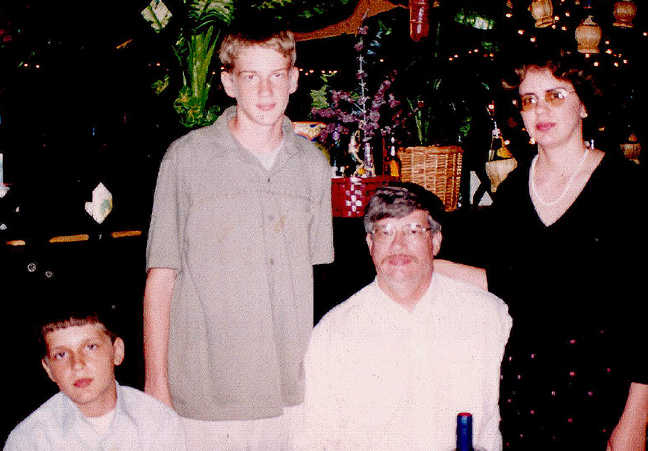 Since the Navy, we've been busy raising three great kids, Kristin –24, Richard – 22 and Kristopher –17. We're very active in church and the Boy Scouts. I'm currently a scoutmaster for Troop 677. I'm employed by the General Services Administration (GSA) as an IT project manager. After Hurricane Ivan, I found a Catalina 22 which had been spared. 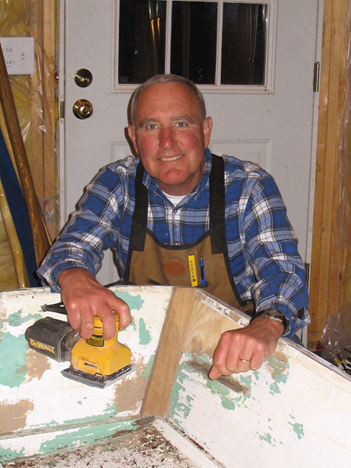 I purchased the sailboat and made the repairs to bring the boat back to pre-storm conditions. My wife and I have thoroughly enjoyed our C-22 and are having a great time day-sailing "No Regrets" on the Gulf Coast of Northwest Florida. It was a long dry spell during college and most of my 21-year Air Force career until 1975 when I was reintroduced to sailing on a Cal 25. My neighbor asked me to substitute for him on a Friday night race. He said not to worry because “Jim will teach you everything you need to know.” After that, I was hooked on sailing and racing. I traded an old Volkswagen bug for a 16-ft Petrel wooden boat kit with homemade nylon sails and glassed-over wood, but it sailed. I moved up to a Venture 21, because I thought I couldn't afford a new Catalina 22. After a year of wet sailing from the hole in the cockpit where the keel cable hung and a broken hand from the trailer-type keel winch, I ordered a new 1976 Catalina 22 and named her “Elixir” for something that cures almost everything. 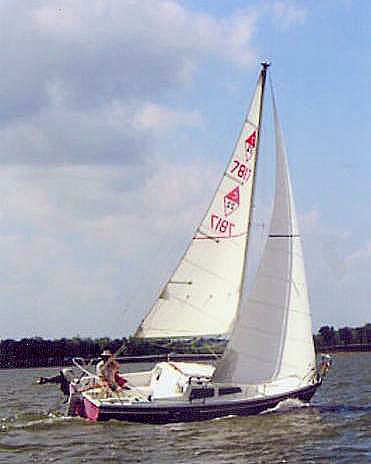 I started racing in earnest in local regattas and did pretty well; I even took her to the 1981 Nationals in Ocala, FL. When I arrived with my 15-year old son, the local fleet captain noticed the boat was rigged for spinnaker and welcomed me to the spinnaker fleet. When I told him I'd left the spinnaker home, he replied, “We need a fifth boat to make a fleet; we'll get you one.” With it, the two of us finished 3rd, won a beautiful silver trophy, and my son was really impressed. I had trouble winning against another local Catalina 22 in the same series, so in 1989, when the owner decided to move up to a larger boat, I bought “Jagged Edge” from him. She's served me well over 16 years, but at the 2004 Nationals in Atlanta I fell in love with the new Catalina Sport: to compete with the older, lighter C22s I needed a new Sport. As I enter the twilight of my sailing and racing career, I can think of no better name for my new boat than “Twilight Zone.” I hope she'll be a happy boat. I know I'll be a happy sailor. Fair winds to all. It's odd that the very lake I sail today is the same lake where I was so terrified as a kid during my first experience on a sailboat. Cayuga Lake, of the New York Finger Lakes, is where, as an eight-year old boy, I gave my father a direct order to move to the high side of a friend's boat or else we where going to tip over! Well we didn't tip, I got over the fear, and 37 years and five boats later I love nothing more than a good sail on my Catalina 22 on Cayuga Lake. My boats started small, then got faster, then got bigger, and now have returned to the perfect size for my kind of sailing. I enjoy having the ability to stay relatively dry, to anchor out and sleep on the hook, and to haul my baby where ever I feel the desire to sail. For me, the low cost of owning a 22 directly enhances the level of fun! I've sailed for over 20 years and haven't been without a boat for almost the entire time. Currently I own "Ragamuffin," my Catalina 22, "Sweet Pea," a Point Jude 15, and a 15 foot canoe. My boat ownership philosophy is drawing parallel to my bicycle ownership theory: you can never have too many! Different bikes for different purposes, different boats for different purposes. My love of bicycles led me to opening a bicycle shop way back in 1981. 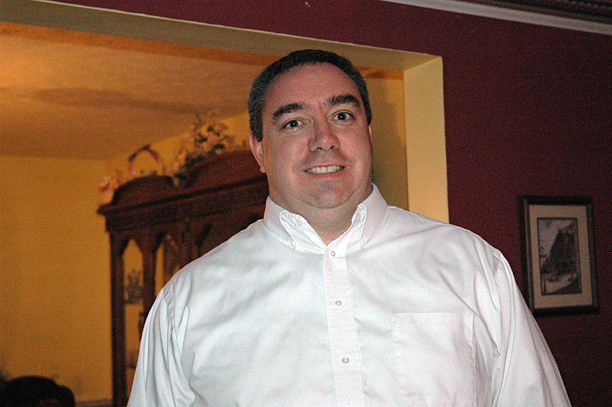 This year I celebrated my twenty fifth year in business! Owning a retail store does cut into my weekend sailing but having Mondays off allows me to have the lake and ramps to myself during prime sailing season. One other drawback, which I hope to turn into a positive, of owning a seasonal business that conflicts with summer sailing, is that I have loads of free time while the northern waters are a little on the solid side. Add it up, a strong tow vehicle, a trailerable boat, time and money equals . . .
Maggie and I bought our C-22 in October of '04 after owning a MFG Charger 19' and a Capri 14.2. The C-22 will be renamed “Surprise” in honor of the ship of the same name from Patrick O'Brian’s books. During the season “Surprise” sails White Bear Lake, MN; home of White Bear Boatworks (formerly Johnson Boatworks) of scow fame. For over 100 years it has been a sailor’s lake. 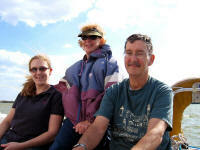 Whenever possible, we charter and cruise Lake Superior and Green Bay. I started sailing in the early ‘90s after taking a Red Cross basic sailing course on a whim: this coming season I have volunteered to teach the same course. Professionally, I am a chemist by training and education, and practice patent law. Maggie started sailing shortly after we hooked up in ‘97, and has left the life as a corporate drone to pursue writing children's literature and watercolor painting. Born on Nov, 4, 1936, as a kid I raced Comets; actually crewed, but I did get lucky and won the crew race. I taught sailing in Lightnings for a while. From a college scholarship I came out an Ensign in the US Navy. After flight school I spent the next years flying off aircraft carriers; the Intrepid, Essex, and Randolph. I was squadron Landing Signal Officer when not being shot off the ship. I came out as LCDR, moved to Texas and was an air-conditioning engineer until I joined Delta Air Lines in ’66. 30-years later I retired as an airline captain. 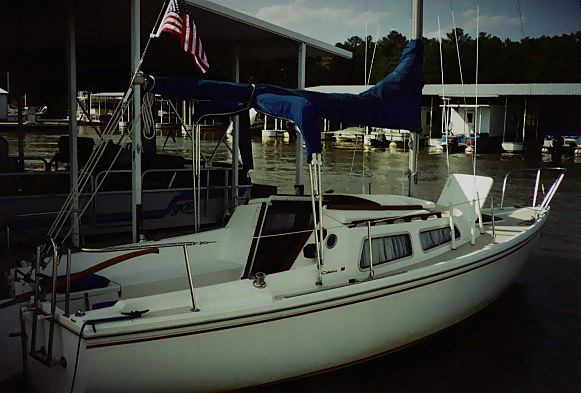 I owned a Gulf Coast 29 for a while, then an ’83 C22, lost to Hurricane Ike, before finding my current ’87 on Lake Fork, TX. I enjoy woodworking, and coming up with solutions and inventions. Side occupations and endeavors over the years have included the starting of a swimming pool construction business, residential and commercial architectural design work and construction, and cattle raising on our Texas ranch. One chore I have ahead of me is making my beautiful former airline stewardess wife Becky comfortable on a boat that ‘tilts’! I am retired from the US Navy and still love boats! There's just something about being on the water... any water... in any boat, that is magical in its own way. The feeling I get when I'm sailing is like no other except maybe flying a kite (which I still do on occasion). I took my first sail in 1975. I loved it so much that I signed up for lessons the very next weekend. I've owned many boats over the years... oddly, many of them powerboats, but I've not loved any as much as I do my C-22! I've had "Wind Toy II" since Oct of 2000. I enjoy working on her almost as much as I do sailing her. I am mostly a day sailor, but I have made a 90 mile (each way) open-ocean trip to Catalina Island, although it was in my previous boat ("Wind Toy I", an Islander 24). I especially enjoy single-handed late-afternoon, into-the-evening "sunset cruises." A nice breeze, some Jimmy Buffett, & a bottle of my favorite thirst quencher... and I'm on a 4 hour vacation from the rest of the world! I am blessed to live in some of the best sailing weather in the USA. I sail as often as I can, but it is not nearly often enough for me! I’ve spent nearly every summer of my life piloting small craft around the east end of Nantucket Sound. I first learned to sail while sitting in the “bathtub” well of our Sunfish and continued my education on Beatle Cats, O’Day day sailors and 420s at the local yacht club. “Our EsCape” is our (co-managed with my father Tad) first foray into cruising. Like many weekend sea-bound warriors, I know just enough to get into trouble from time to time, with (usually) enough luck to get out of it unscathed. When I’m not sailing or thinking about sailing, I love to cook, travel and ski. 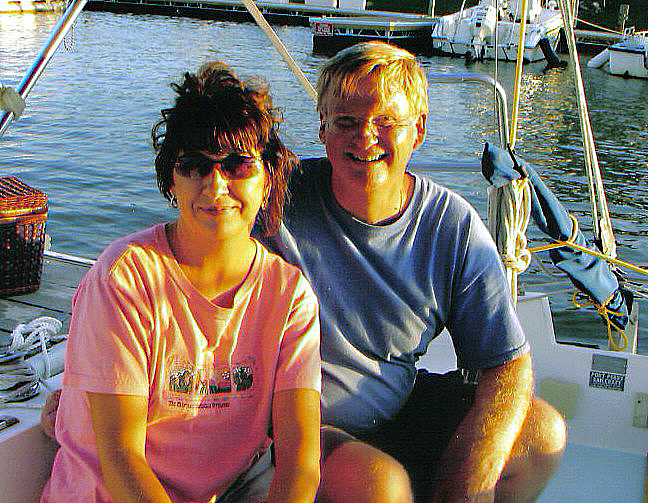 My wife, Ruth, and I have been sailing for 35 years. We started our sailing adventures sailing a Grumman canoe with a homemade sail rig. 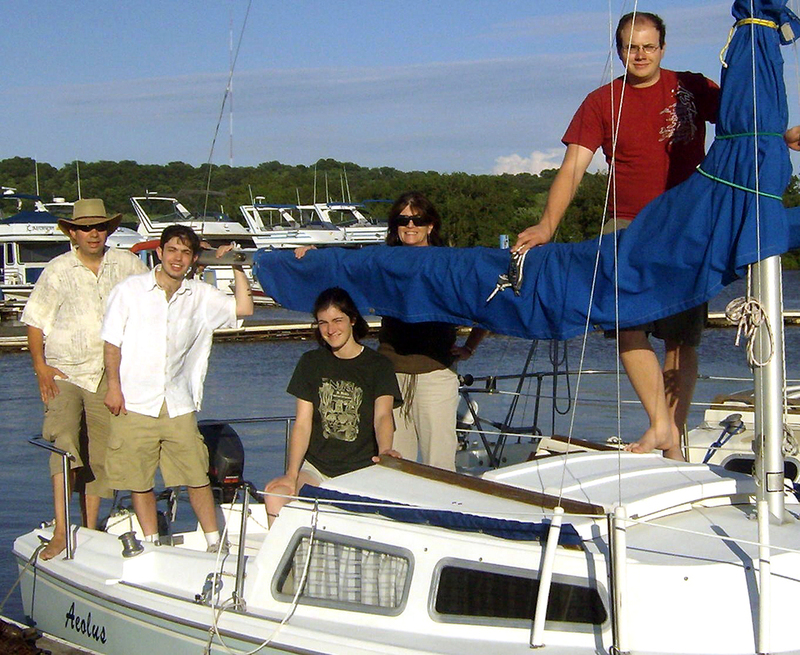 We sailed the canoe for five years then bought a Catalina 22 swing keel. We sailed that C22 for ten years. We decided we needed a bigger boat as our family was growing. 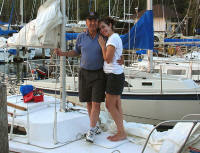 After having our daughter Emily was born in 1981 we soon, in 1985, ordered a Catalina 25 fin keel. We placed fourth in a 1985 Catalina 25 national regatta, three weeks after receiving our brand new 25. We aren’t really racers, we were talked into entering the national regatta just to say we raced in one. 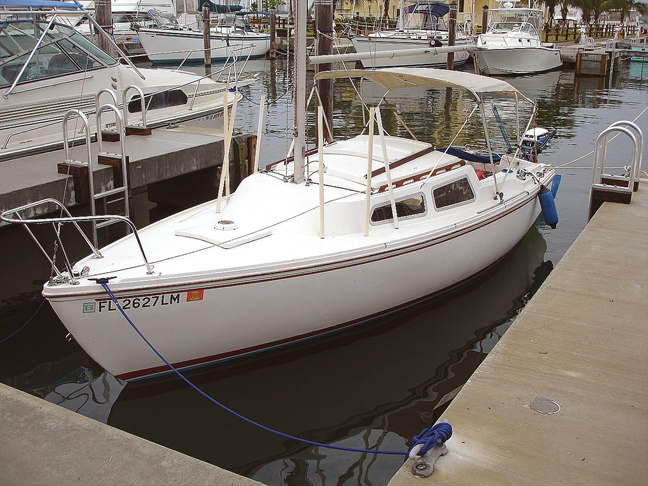 The lake in which we now sail needs a shallow draft boat, so this past year we sold our 25 and purchased a 1989 Catalina 22 wing keel, #14834. I’m a retired sheet metal worker, my wife is a retired school librarian. I'm 63 and her age is unknown, if you know what I mean. We're cruisers but we do get in a few fun club races on Indian Lake. 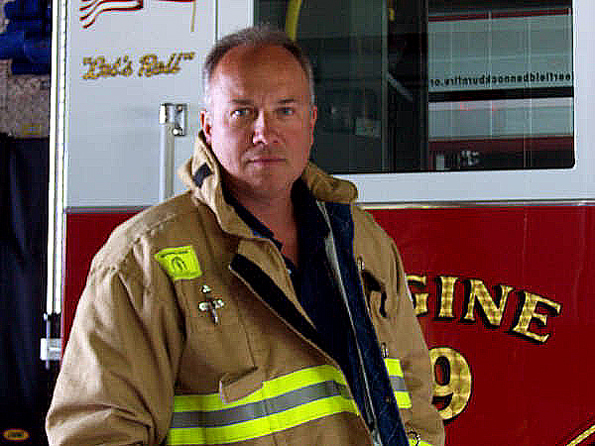 I'm a 48 year-old firefighter from Deerfield, IL. I am recently divorced with two beautiful and happy daughters. I've been sailing for about 25 years, mostly on HobieCats but more recently on “Penguino,” my 1984 Catalina 22. I bought her three years ago in Long Island, NY off of Ebay. Towed her home through a highway closing, black ice, white-out snow storm and have been happily sailing her on Lake Michigan (Montrose Harbor) since. I'm planning a singlehanded voyage to New Buffalo, MI in July. I am a long-time Californian, a retired high school English teacher, married to Febo and have twin sons who live in Alaska. 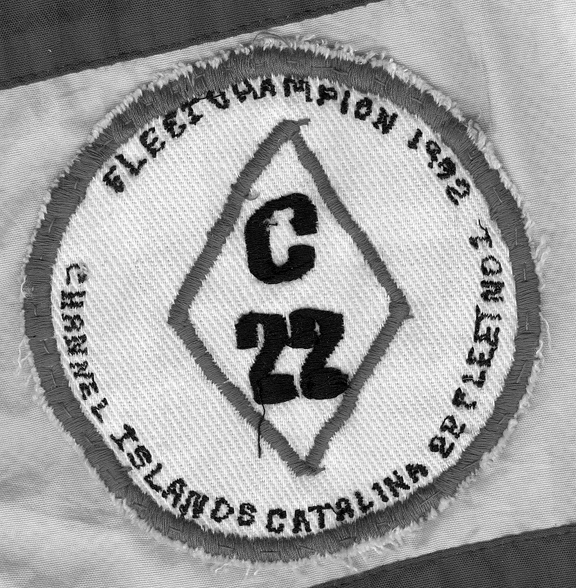 An old friend, an early Catalina 22 National champion, spurred my interest in sailing. I have been doing so off and on since the 1960s. I’m now into my fifth boat. With different sailing partners depending on the week, I trailer to the launch site and sail weekly, year round, in and around San Diego Harbor and off the coast of San Diego. 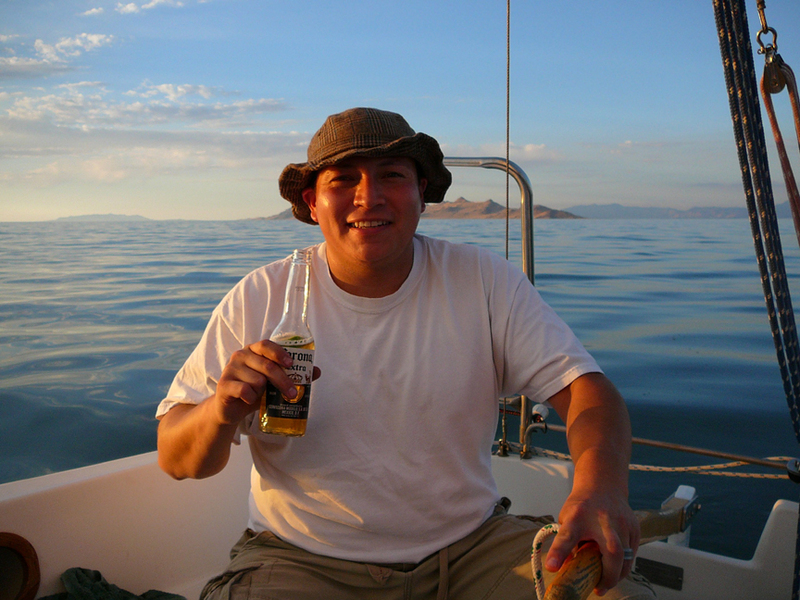 Occasionally, I trailer “Ni Modo Oho” down the Baja peninsula to sail on the Sea of Cortez to the various islands near the town of Loreto; annually, we sail over to Catalina Island from Long Beach, California. Besides sailing; reading; watching movies, particularly French films; traveling to foreign countries such as Belize, Argentina, Costa Rica, Mexico, the Philippines; futzing with my boat consumes much of my “geezer” time. I have always been a boat nut (and have a pretty extensive library of classic cruise journals). Since I got out of school 47 years ago I've virtually always had a boat of some kind. In the early 70's I bought my first sailboat, a Sunfish, and had a ball with that boat, the biggest bang for the sailing dollar on the market at the time. In 1975 I bought a Cape Dory Typhoon; I really liked the classic lines and the characteristics of a heavier boat and lavished time on the teak. In 1980 I moved up to a Cape Dory 22 which my wife and I did some minimal coastal cruising in. 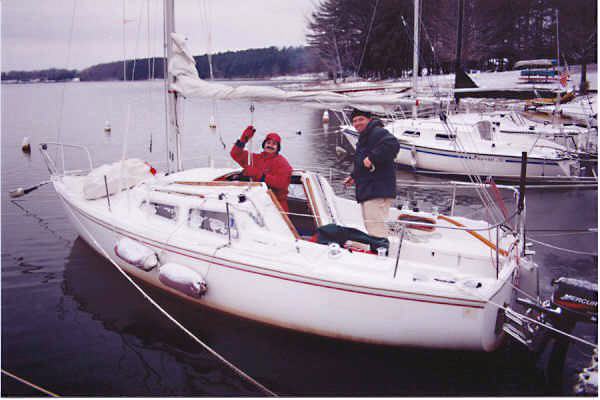 Then in 1982 I moved to a Cape Dory 30 which we cruised extensively from Maine to the Poughkeepsie Yacht Club on the Hudson River. When I transferred out to the San Francisco Bay area I had the Cape Dory 30 shipped out and sailed her there for a number of years (by that time the teak was making me wonder who owned who here). We moved back east, and for seven years I ran all around the Pamlico region with a Parker 21 outboard. I sold that boat along with its 100-gallon gas tank and bought my Cat's Paw, a 2005 Catalina 22 Sport. I couldn't be happier back sailing again here in Chocowinity, NC. 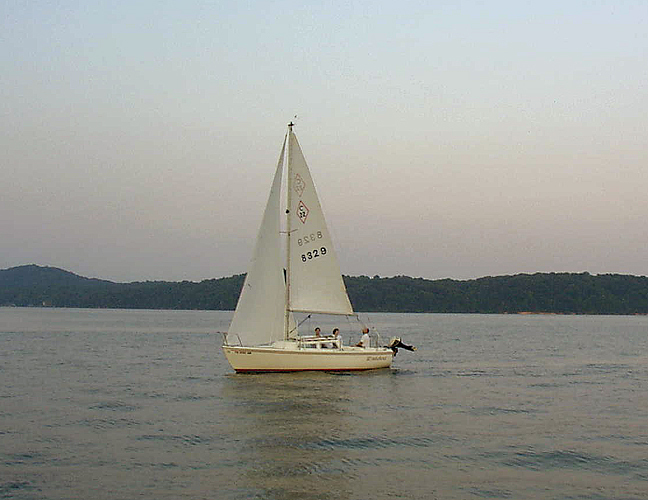 I am a 51-years old returnee to sailing. Having raced, cruised and taught sailing in the early 70’s, I reluctantly set it aside to raise a large family. Thirty years later, kids mostly grown, me divorced and remarried, I asked my new wife, MaryAnn, if she would like to learn to sail. She responded by shopping for and buying our first boat, a ‘77 AMF Paceship 23 while I was on a business trip. You gotta love a girl like that! The Paceship was fun, but hard to launch and haul. After some more looking, we decided the C22 is about the best all-around boat for us and bought “Martha Pearl” (our mothers’ first names put together) in 2001. 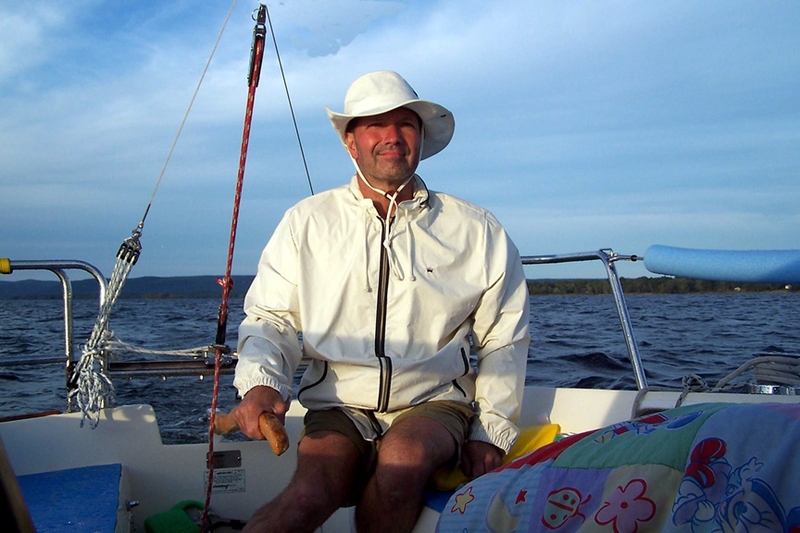 We mostly sail eastern Lake Ontario and the St. Lawrence River, but occasionally other lakes. I’m a paper industry consultant and MaryAnn is a nursing professor, so she can follow me around during the summer recess. We often stay on the boat when I’m working in upstate NY. “Martha Pearl” has really brought our new, even larger family together. 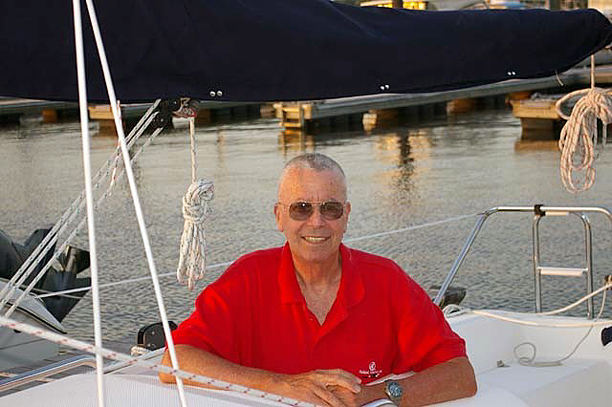 I'm over 70 and have been sailing for more than 40 years. I joined this group to see if I could find old friends. I was a member of Anacapa YC in Channel Islands Harbor, CA when we formed Fleet 1. Tom Winans was our fleet captain, I was race committee chairman, and Frank Butler was a club member. 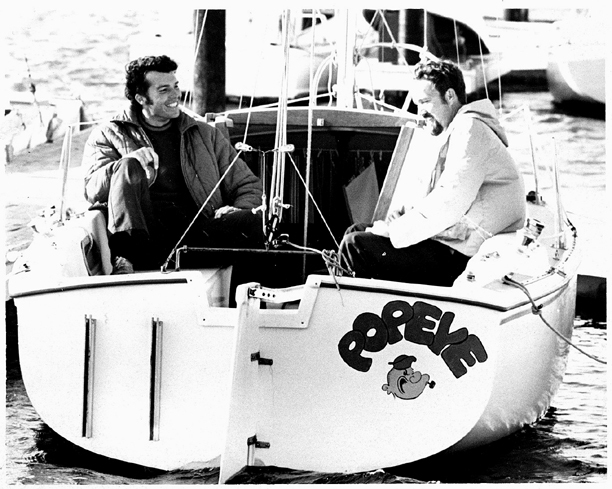 If you have a copy of Issue 1 of the MainBrace (maybe Issue 2) you'll see a photo of me sitting in my boat with Tom. 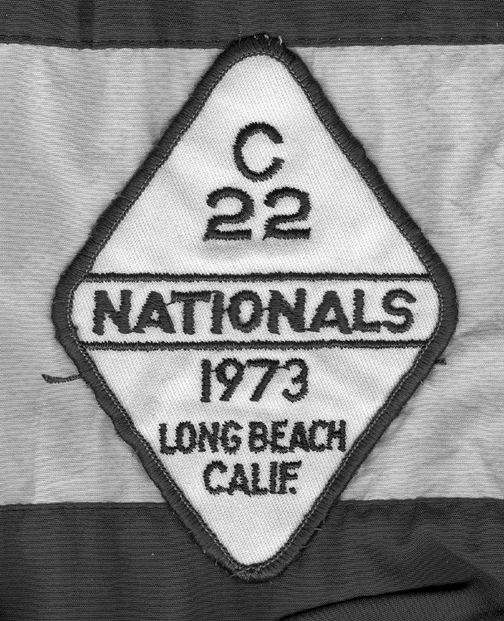 I raced in two C22 national championship regattas, the first (which I won) being the "California State Championship" (which we all called the "first" Nationals). 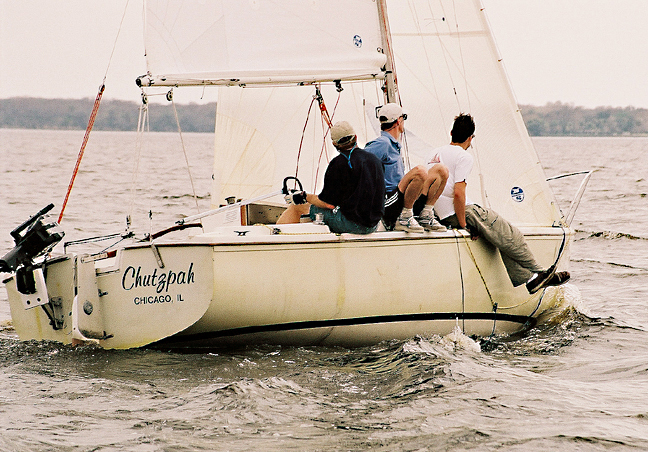 Following this regatta, the C22NSA was formed at a meeting of skippers. I also sailed in the Long Beach Nationals. I think I finished 10th after a DSQ. With Susan as crew we cruised the So-Cal coastline from Santa Barbara to San Diego and touched all of the Channel Islands. My latest obsession is radio controlled model yacht racing. 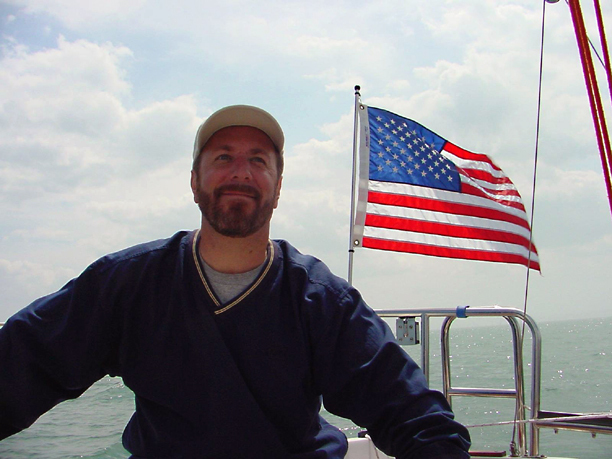 I travel all over the country sailing in RC events, and serve as the U.S. One Meter Class Secretary of the American Model Yacht Association. Why not? It satisfies my competitive urge, and I don't have to get my pants wet! Is it possible to have too many interests/hobbies? 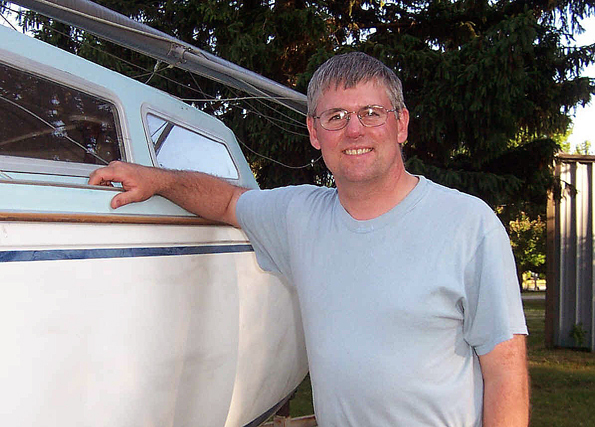 Besides sailing, at age 40 I enjoy church, working with our Pathfinder youth group, spending time with friends, scuba diving, mountain biking, r/c aircraft, camping, fishing, and canoeing. But I think I have always loved sailing. 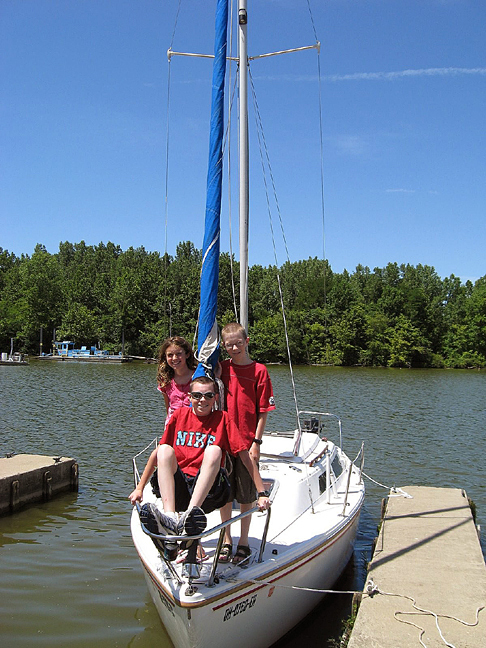 As a kid, we had a Starfish sailboat (a Sunfish knockoff), and lived close to Lake Murray in Southern Oklahoma. I learned to sail on it, although I realize now how little I knew about sailing then. Fortunately it was a forgiving boat, and we still had a ball on it. Eventually we got rid of it when I went off to school. Since then some major changes happened in my life: getting married to my wonderful wife of 19 years now, and having two beautiful daughters. But I never lost my desire to get back into sailing. Our choice of a C22 was influenced by our love of the water, camping, and scuba diving: it offered the best combination of uses to fit our interests. 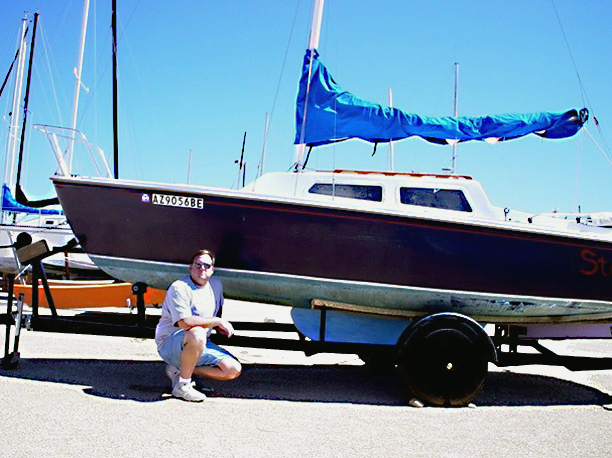 2½ years ago we bought my uncle's C22, "Catch 22", which we renamed “Seas The Day” and began the the restoration. There was a career-change interruption, but I've resumed the work. The to-do list is long, but the work is enjoyable; I'm hoping for a fall launch. If any of you central Texas sailors see us out on the water, don't be shy, we'd like to meet you! Meanwhile, I'll continue building my commercial sound system business – after all, a guy has to have some way of supporting his habits, or rather, hobbies, right?!! 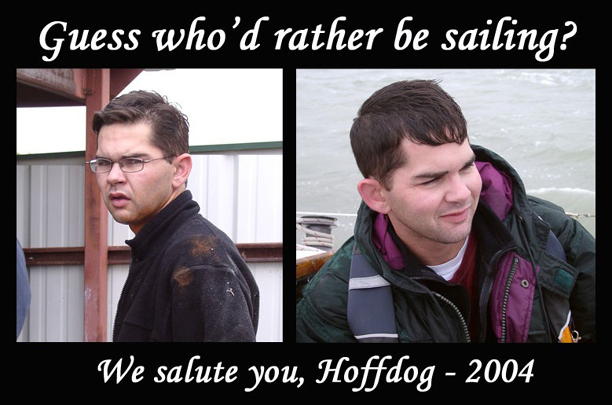 To support my sailing habit, I'm an environmental chemist in Billings, MT, where I live with my three salty dogs. Although sailing is my favorite activity, I also hunt and fish as much as I can. In fact my favorite thing is to fish from the sailboat. I've been sailing since I was literally three feet tall, and came from a sailing family. My previous boats include a Sunfish, West Wight Potter 15, Bristol 24 and a ski boat. When I'm not towing the C22 around the country to various events, I keep Redhead on the Big Horn Canyon National Recreation Area. 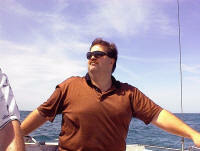 I also sail my Boston Whaler Harpoon 5.2 during the week, when I can't get to the big boat. Maybe it's mid-life (Is 52 mid-life?) crisis, I don't know, but last year I realized I didn't own any toys. Single, good job, and no toys... What's with that? So last spring I invited a my cousin Larry to join me in taking lessons from Portland's Island Sailing. It was a good class and when we hit the water the wind was howling on the Columbia. Although we basically spent those two days just going back and forth, back and forth, and more back and forth across the river, I was hooked in learning more and started dreaming of taking off for the south seas. All I had to do was get a boat, head downstream and take a left when I can't see land behind me anymore. 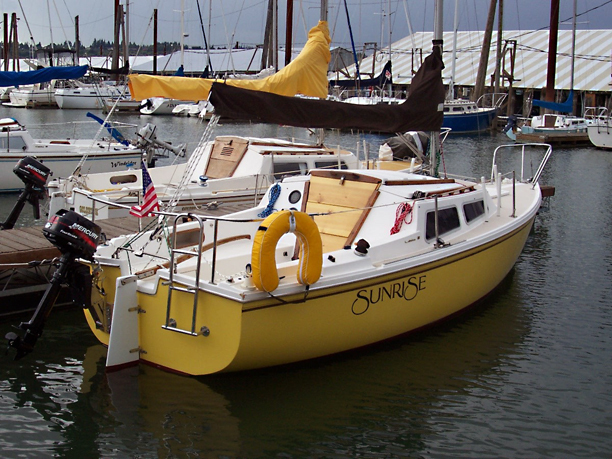 In June of 2004, “Sunrise,” an '82 Catalina 22, became available. Now, I spend what little money I have fixing her up, keeping her safe, and trying to figure out how to sail her the best I can. I'm a 53 year old rookie sailboat owner who has read a tremendous amount on the subject and want to find out if I like it as much as I think I will. I recently purchased a 1986 C-22 from her (apparently) 4th owner. In her life it seems she was sold and originally registered in Georgia and sailed as the "Wunderlust." At some point she found herself transferred to Miami, Florida, and re-named "Tic Tack II." As soon as I get her registration completed, I'll perform the traditional de-naming and re-naming ceremonies to christen her the "SEA 22." My new better half of 10 years, Betty, has been totally supportive of me trying new things and following my dreams, even at the expense of her own comfort zone. To that I say thank you and promise to try to keep the rails out of the water. I've been a draftsman, quality control technician, chemical plant operator, instrumentation technician, licensed electrician, and currently an electrical estimator. Born in the mountains of Virginia, raised in the flatlands, now living in Florida after a nasty divorce -- I have always loved the ocean. My first experience sailing was at about age 8 riding in my wagon. I carried a large piece of cardboard along and let the Illinois winds blow me downwind. I watched and admired sailboats on Lake Michigan as we drove down Lake Shore Drive in Chicago. At age 16 I finally got to try my hand at sailing in a small Styrofoam sailboat at Boy Scout summer camp. Since then, I've lived in the Puget Sound area near Seattle, WA -- water all around and lots of boats motoring and sailing everywhere you look. But it was only the sailboats that got my attention. It wasn't until age 49 when my younger brother bought a Catalina 22 that I finally realized that I could afford to own one of these things. I sailed a few times with him and asked when we could take my wife out for a ride. He tossed me the keys and said "You know how to do it. Have fun." Of course it was a real light wind day and we mostly just drifted. But that was enough to get me started. I bought A C22 with my dad as partner. The first time we set sail was into small-craft warnings and nearly killed ourselves. I then realized that maybe I should take lessons. Two months later I was single handing Slow Flight every weekend -- in the middle of winter! Each time out I pushed my personal comfort/safety envelope as far as reasonable. A few months later I entered my first race and did well even though I didn't know where the first turning mark was (they said "just follow everyone else"). I hit the start line perfectly and led the small pack. When I finally looked back I saw they were all going the other way and I didn't know toward where. Somehow I got 4th place and I was hooked on racing. I'm returning to sailing as a second-time beginner. I learned to sail on dinghies at Boy Scout camp when I was a kid and fell in love. Unfortunately, other than scout camp I had no access to sailing throughout college and grad school. Now I and my family have settled so I have had the opportunity to once again pick up sailing. I'm an avid camper, so the idea of having a boat that I could sleep aboard has always held great appeal for me. I just happened upon the C22 because it was reasonably priced, and "Lazy 7" was in excellent shape for an older boat. The name "Lazy 7" is a dedication to my grandad who used the name as a cattle brand. So far, my sailing has been limited to the local lake, but I do hope to get out to the coast a bit this fall as I feel more confident. Currently, my fleet consists of a 12' recreational kayak, a 12' Jon Boat, and of course my C22. I'm hoping "Lazy 7" will be a great boat for my wife and daughters and me for years to come. My first mate, Elaine (left), and I are relatively new to sailing, having purchased our Catalina 22 in July, 2002. We kept the current name, Impromptu, because it seemed to fit, we really couldn’t come up with anything better, and didn’t want to bother with an involved re-naming ceremony. 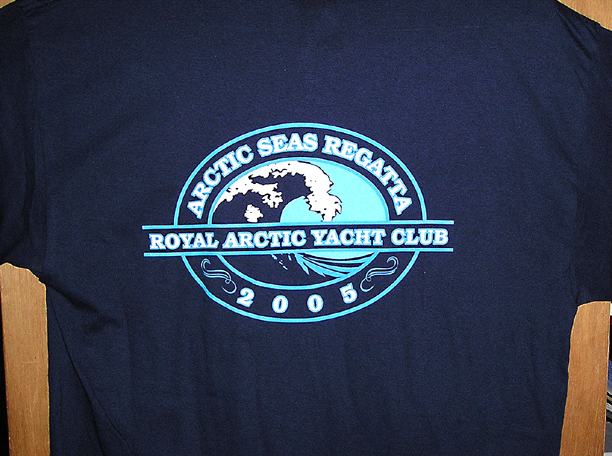 We spent most of the summer of 2002 in clean-up and restoration with first splash in September. 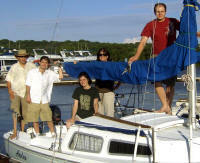 The 2003 and 2004 seasons were spent sailing on Sodus Bay and Lake Ontario, NY. 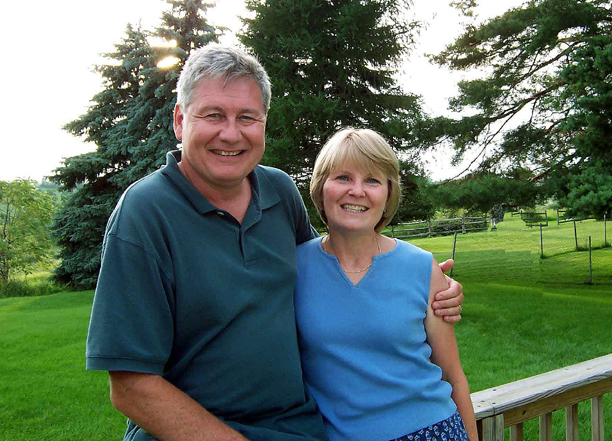 In July 2004 we retired from active employment: I after 36 years with Eastman Kodak, most recently as a quality assurance supervisor supporting consumer and professional film manufacturing, and Elaine as human resource manager for Kaufmann’s Department Stores. 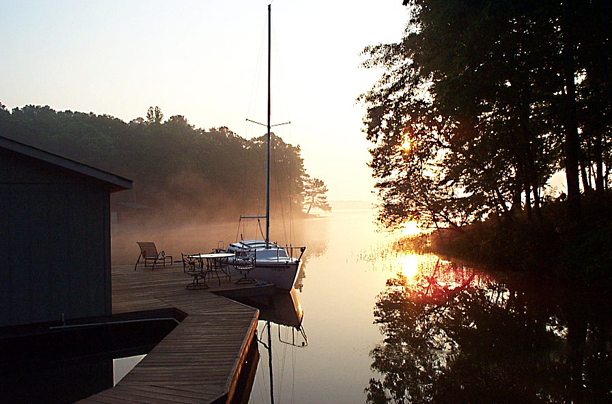 In March 2005, Elaine and I relocated to New Bern, NC and keep Impromptu at Northwest Creek Marina, adjacent to the Neuse River with easy access to the sounds and Outer Banks. We are primarily interested in day cruising (the 2004 Great Lakes Cruise was great!!) and are searching for the just the right Catalina 320 as our move-up boat. I began sailing in Milwaukee on a Flying Dutchman Junior with the Marquette University Sailing Club in the late 60’s. I’ve been hooked ever since. I bought my first boat in the 80’s when I moved to Perth, Australia on assignment with John Deere. 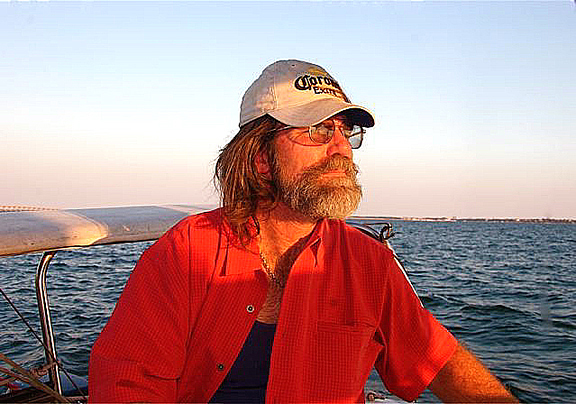 For three years I was in sailing heaven with “Andora,” a Red Witch 21 foot cruiser/racer designed for the conditions in Western Australia. 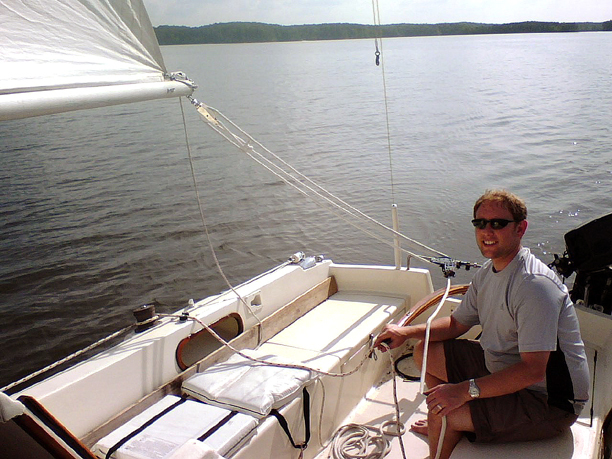 Returning to Dubuque, I sailed occasionally with friends on the Mississippi River or local lakes while I focused on raising our family and paying bills for tuition etc. After years of repressing the urge, Mary and I finally jumped back in and bought “Aeolus” (Greek God of Winds) in 2008 from a couple who sailed her on Lake Michigan. We joined the Dubuque Sailing Club. We keep her on a slip at the Dubuque Marina so, within 15 minutes of getting the urge, we can be cruising or racing on the ever changing, always picturesque upper Mississippi river. The family photo shows me, Matt (lawyer), Cara (teacher in Dallas), Mary (Life Coach) and Michael (Bio-Mechanical Engineer). Tom (Criminal Justice student) is not pictured. 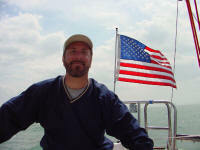 My fascination with the sea and sailing started with a tour of U.S.S. Constellation as a kid. Looking at the Inner Harbor of Baltimore from the deck of that sailing ship, I heard the faint calls of distant ports and the accompanying adventures. Those calls grew louder as I spent summers with my grandparents at their cottage in Townsends Inlet, NJ, watching sailboats pass in and out of the inlet, wondering about the adventures they would or did have. Then life happened. I made my living in the IT industry and will be moving from full time to semi-retired. It’s been 45 years since I first boarded a sailing ship but still hear that call every time I get near or on the water. Angie and I bought ‘Sunshine’, our first step towards the possible transition to a full time cruising life in a couple of years. We’ll take lessons and spend the next couple of years sailing lakes in N.E. Oklahoma and occasionally the Northern Gulf Coast, building our experiences and making new friends. Fair winds and smooth seas to all. 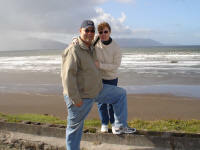 My wife Carol and I decided to see some of the Northwest by boat after moving here from Sarasota, FL in 2000. 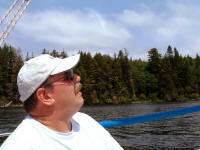 Although we keep our Catalina 22 at Deer Lake, we have taken it for cruises on some of the larger lakes in the area. I started sailing in Charleston, SC in the late ‘70s, first on a Sol Cat 18 and then on a 1970 Catalina 22 when I realized that a motor would help get us against the tide. That first Catalina was a wonderful boat for single-handed sailing up and down the coast. In Florida I had to switch down to a San Juan 21 because of shallow water off the dock. I never forgot my old C22 (with its through the hull head) so when the opportunity came up we brought one to Spokane. We added the power lift to the pop-top and with the tent on, the boat has been surprisingly comfortable a few days at a time. I replaced the very inefficient Coleman 48 step/cooler with a small pantry. Taking the dogs ashore was hard on the inflatable so now we use a port-a-bote lined with Astroturf so they don’t slide around. When not working or sailing, I play low brass with some of the groups around town. 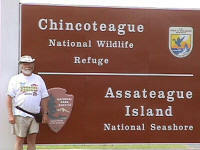 After living in Youngstown OH, Salem MA, and Allentown PA, we (my partner and I) moved to Nags Head NC in 2001. (Is there a bit of wanderlust in my veins? ) Being on this spit of sand, I couldn't help being bit by the boating bug. The Outer Banks is a big power-boating community, but as luck would have it, my very good friend talked me into buying a Sunfish to learn to sail before making a decision. As it turned out, I took a few sailing lessons and loved it. 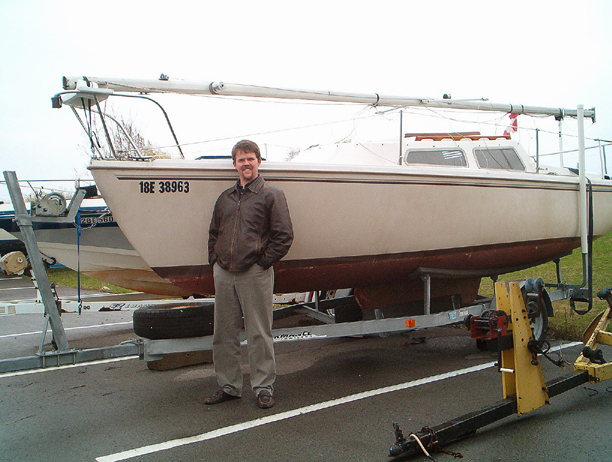 Last fall (2004) I decided it was time to buy a larger boat, something I could go out on with friends. I did some research and decided the Catalina 22 fit the bill. Thus, is my boating story. On a professional note, I work remotely from my home for Sungard Pentamation as a senior programmer analyst. I've been with the company for 8 years and have been in the computer field for nearly 20. A few years ago I went to Peter Kump's school of Culinary Art in Manhattan. I hoped for a career change, but soon found a chef's salary would not support myself and 4 years college tuition for my son. I bought the wing keeled "Half Fast" in the summer of 2006 from a colleague at work who sailed her on Guntersville Lake in North Alabama. She was reasonably equipped, lacking only a VHF radio and antenna, which I've installed. I'm a cruiser so I have the boat set up with comfort in mind rather than speed. My cruising, thus far, has been inland and mostly singlehanded. Because I enjoy the boat so much, I've so far successfully avoided enticement by larger boats. 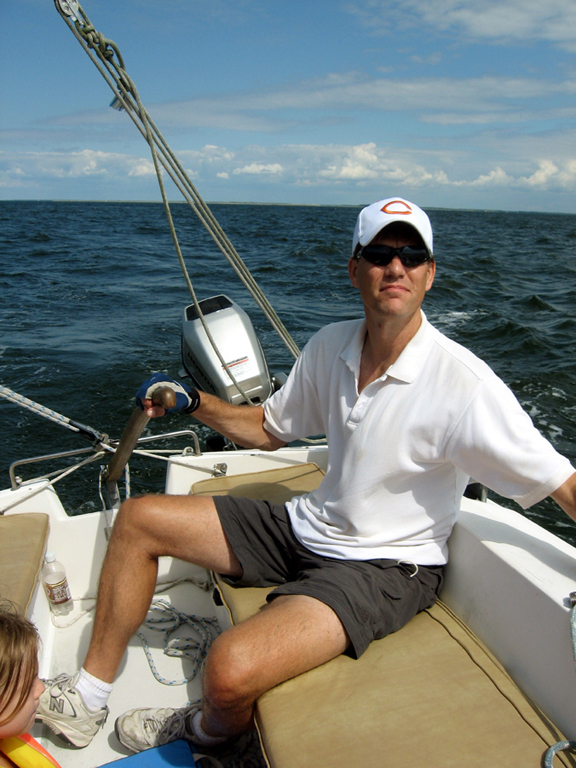 I'm 50, have been married to a wonderful wife for 25 years, and have the good fortune of an admiral who enjoys sailing almost as much as I do. My heroes are my son and daughter-in-law, both currently serving in the United States Marine Corps. Although I no longer make a living at it, I'm an artist (University of Montevallo, BFA) and create and sell artwork as I have time. I earn my keep as a quality assurance manager for an automotive supplier. 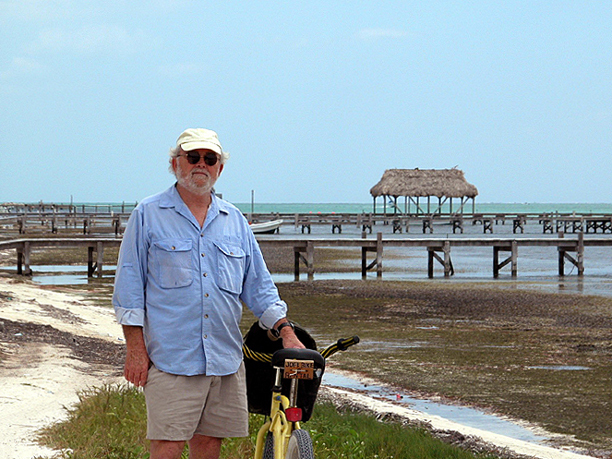 When I'm not sailing or earning a living, I'm looking forward to retirement. Besides sailing, other hobbies include building and paddling wooden canoes. I've enjoyed paddling the Boundary Waters in Canada, the White and Buffalo Rivers in Arkansas, the Duck River in Tennessee, and I hope to paddle the Black Warrior soon. I farm near Moline, Illinois -- John Deere country. After college ('83 University of Illinois) I lived and worked in Chicago, posted my desire to crew (having never really sailed) on a bulletin board, and got a call from a guy named Bob. I've sailed with him ever since. He and his wonderful wife Carolyn are God parents to my first born. I started on his J24 "Surprise." Later Bob bought a J30, "Innisfree." Somewhere in there we both crewed on another friend's Tartan Ten, "Temerity," which went on to win the Mac for T10's, second overall, a couple of years ago. 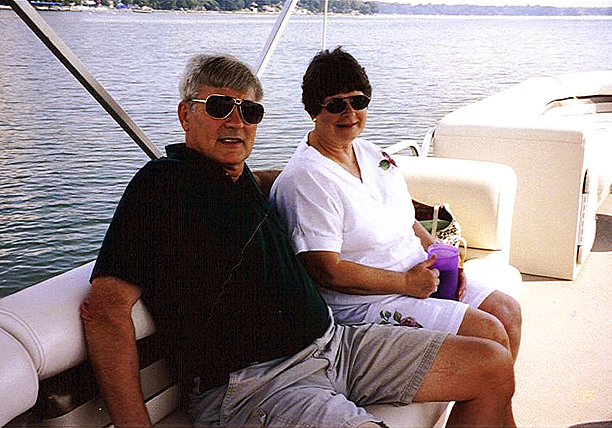 At 81, Bob's wife influenced him to sell the J30 a few of years ago. Before the next season several of the crew chipped in and bought a recently rebuilt T10, "Yanqui." Bob bought in too, so we now race together again. In1987 I bought a farm and moved to it, added to it over the years. 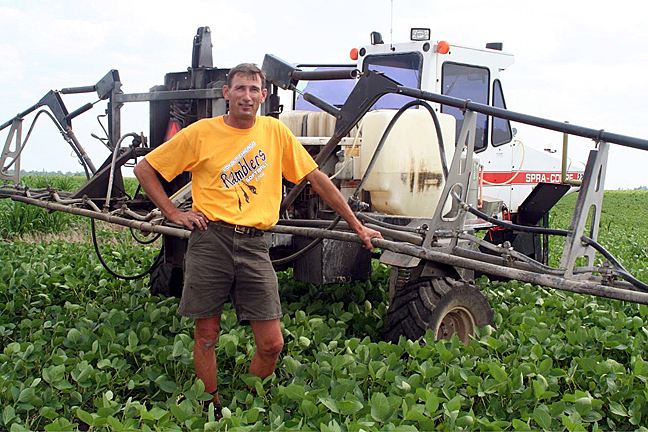 I grow corn and soybeans. I don't sail as much now being across the state and raising a family, but have done some scow racing on the Mississippi. So do I refurb/fit #3 (recently given to me but that's another story) and take it on a summer cruise? I've done very little cruising, but this new little C22 of mine just might come in handy. I come from a sailing family. My father lives and sails the Gulf of Mexico and my father-in-law sails Long Island Sound; my uncle lived, sailed, and wrote a sailing magazine in Puerto Rico. My cousin is in the Coast Guard, stationed in Guantanamo; he lives in Miami and sails the Florida coast. I went out once, got hooked, and figure I'd join them. After my first year sailing with my father-in-law, I decided to buy my first boat. Since I didn't know if this is a thing that I can afford, I searched for a reasonably-priced one. Then I sold my wife with the idea of lets buy a sailboat and that would be our summer vacation every year instead of spending thousands of dollars in Disney every summer. My wife used to spend her summers on a sailboat when she was a teenager so I didn't have to twist her arm very much. I started looking around and fell in love with Whisper. I've owned her for three years and already have had so many memories of sailing the Sound: every time I go out its a new experience. I'm still a little green when it comes to sailing but every day I learn something new. I first loved sailboats when I was a teen working at a dock in Manset, Maine. I used to clean the sailboats as they came out of storage for the summer. From there I worked for a time at Hinckley Yachts. I was a sailing dreamer. This summer on the way to the annual Blues Festival in Rockland I saw my boat. There she was beside the road with a for sale sign. Although it was everything I wanted in a sailboat, I thought it was a little out of my reach. My friend said to me, “Candy, if you really want something you will find a way.” He was right and now, many years after that summer job at The Boathouse, I finally have my sailboat. I am keeping the name Sea Bear because my Rottweiler who also dreams of sailing and loves going out on the boat. She looks like a bear with a life jacket on. More about me? I have two children, I work as a secretary, my hobbies include stain glass, photo journaling, belly dancing and learning to play guitar. I am also a Maine Guide. 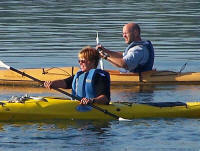 Here I am guiding sea kayakers. Born in Little Rock, Arkansas, I'm no stranger to water, fresh water that is -- catfish, trot-lines, 12' flat-bottoms (boat) with a 9.9 looking for that crappie or brim. As a teenager, Civil Air Patrol made me yearn for more flight, so the United States Air Force became my family -- off to England, then Florida; 1992 introduced me to a different kind of water where most of the fish had teeth and you had to learn to dance (shuffle) when you went swimming. The United States Air Force and I divorced in 1993 and I got Florida; but I went to undergrad at Valdosta State University in Georgia, then returned to Florida for law school at Stetson University College of Law in St. Petersburg, FL. And then I began to ache for water sports again. But as I had grown older, I had grown cheaper and power boats cost a lot of dispensable money just to take out on a weekend. As in life, I had learned it's not how fast you got there, but the journey of getting there that counts. So I began exploring sailing. As a former member of two organizations that used airfoils to function (Civil Air Patrol & US Air Force), sailing fascinated me because it's based upon the same principle of physics. 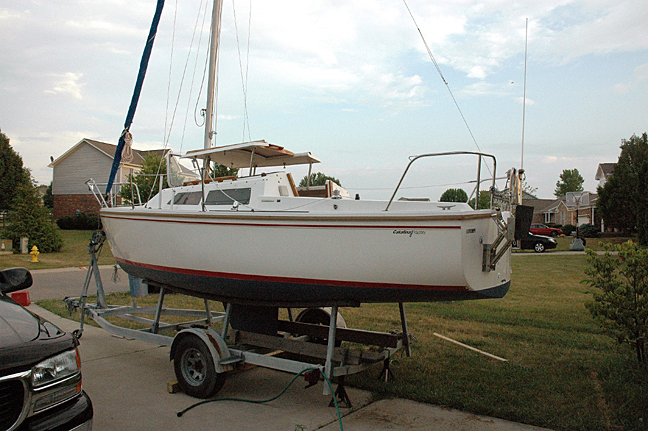 I looked at several sail boats and settled on a Catalina 22 that needed some TLC. 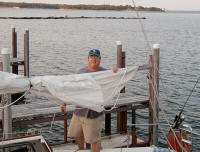 2½ years later, new sails, new motor, and a few thousand dollars and I was SAILING! . . . and so is my wife, my kids, my father-in-law, and anyone else that dares to get near me and my sailboat. I was born in 1969 and my love of sailing began in Oahu, crewing for a friend on his boat “Utopia” out of the Waikiki Yacht Club ~ 1990. 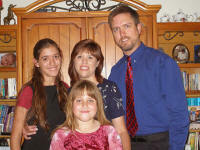 I relocated with my wife, Linda, and daughter Michelle, to Cocoa Beach, FL in 1998. 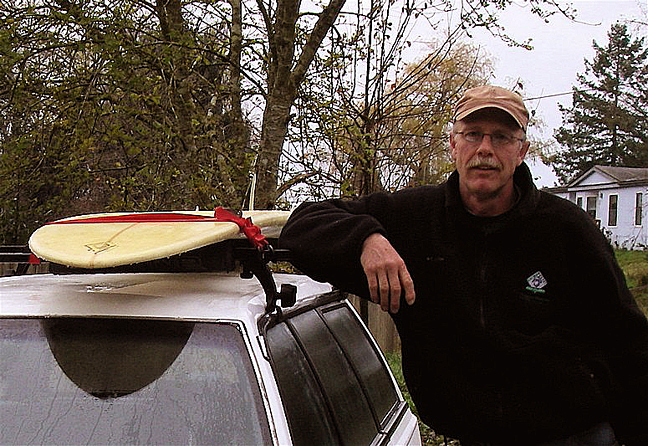 Faced with a lack of surf, I purchased a used Columbia and “cut my teeth” as captain and financier for a few years. 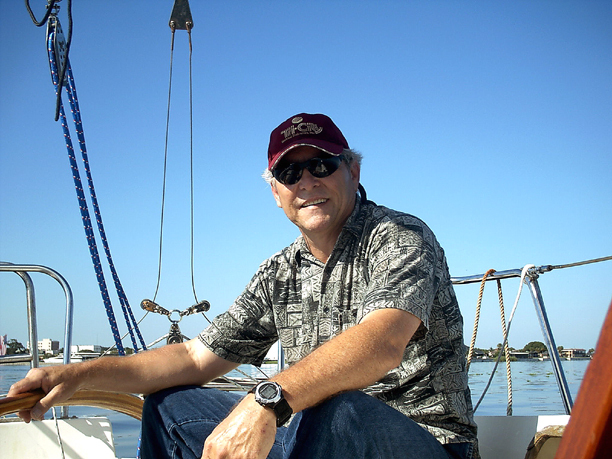 Once my crew relocated to Michigan, I grew tired of living on the beach, but having the boat in a slip some 15 minutes away, so I parted with the original “Pau Hana.” As fate would have it, I purchased a waterfront home on the Banana River just five minutes from Port Canaveral. 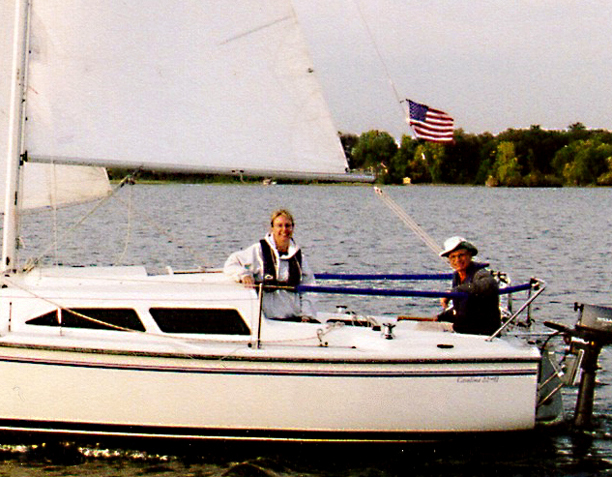 After abandoning a refit of a 1977 Catalina 22, and selling my Laser day sailor, I bought a new Catalina MK2 in 2003. It sits out back in a slip a mere twenty paces from the tiki bar - 30 minutes from Port Canaveral. 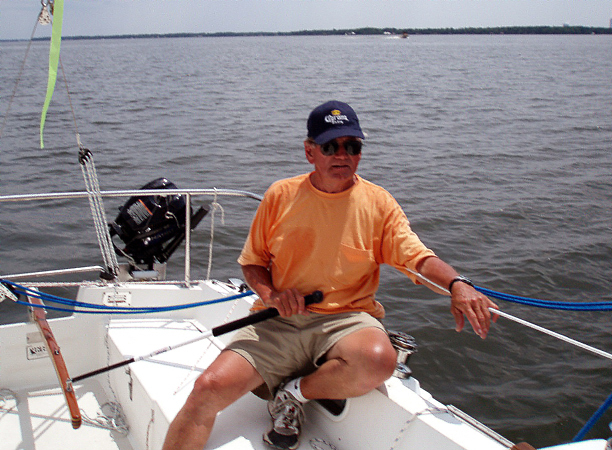 I do not race my boat, preferring sunset sails and excursions through the port or points south via the ICW. I am currently under IBM’s employment and deal predominantly with large scale enterprise systems management and security deployments worldwide. If you find yourself in central (Orlando) or east Florida, please feel free to contact me via the list. Fair winds. I started sailing in 1969 on an Alcort Sailfish that I build during the winter. 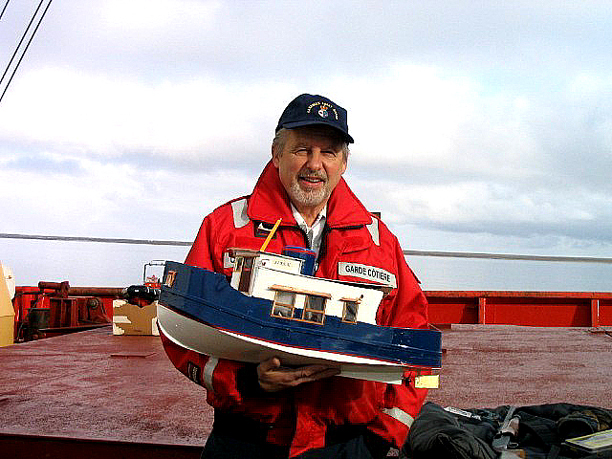 It was a fun boat that my wife, RosaLee, and I enjoyed for quite a number of years. Around 1980,we replaced the Sailfish with a Laser, which we still sail. It has to rank as my favorite wet boat. Our ‘84 C22 came along in 1991. Our pastor, the former owner, named it the “Pensive.” We thought maybe we should add “Ex-” to the beginning of the name. We sail it on Lake Wawasee near Syracuse, Indiana. Wawasee is the largest natural lake in Indiana, about 7 miles long and 3000+ acres. With a north wind we can sail the length of the lake on one tack. 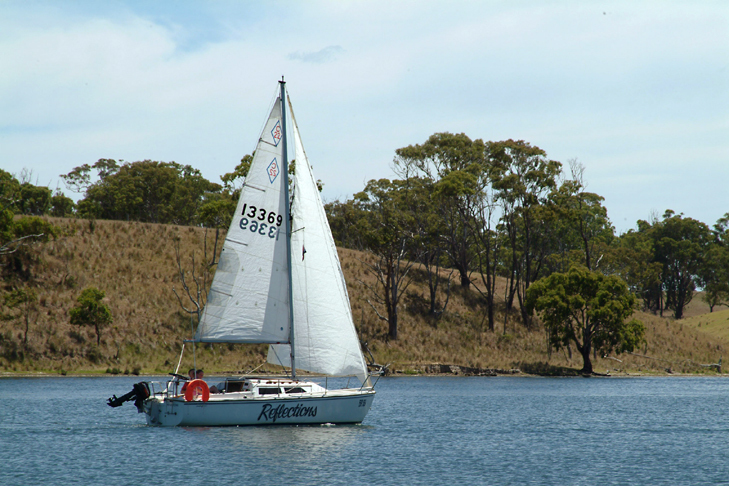 The lake is fairly shallow, but not enough to limit where we sail – a very nice sailing lake. RosaLee and I are retired elementary school teachers. The Laser and C22 share time with a couple of antique cars during the summer. We drive a ‘31 Model A and a ‘26 Model T. They need the same kind of maintenance as a C22, just a little harder to find parts. Caty and I found our “Daydream” by plain luck and coincidence in the fall of 2007. Caty is a creature of the sea, raised in Cartagena, Colombia and always near the sand and waters of the Caribbean. I was born and raised in Carolina, Puerto Rico where I spent most of my free time also in the sands and waters of the same sea. After marrying last June (2007), we decided to make true our interest and passion for sailing and decided to start our journey into this new venture. Why did we say luck and coincidence in the opening sentence? Well, Caty loves dolphins, (so do I but never told her ‘till today as we both write this, jejeje) and always daydreamed of owning a sailboat. We started our search and found a 1976 Catalina 22 (Caty is short for Catalina, first coincidence), named Daydream (second coincidence), it was stored by the previous owner on Dolphin St. (third coincidence), and it was manufactured in 1976 (and the fourth coincidence, ok this one is just not right to say, but she was also “manufactured in 1976”, my in laws will possibly skin me for this comment). So this is the beginning of our story in sailing, many more chapters to come. We were far from B.C. In Victoria the temps are moderate with maybe a week of snow, about the same temps as Seattle but less rain. 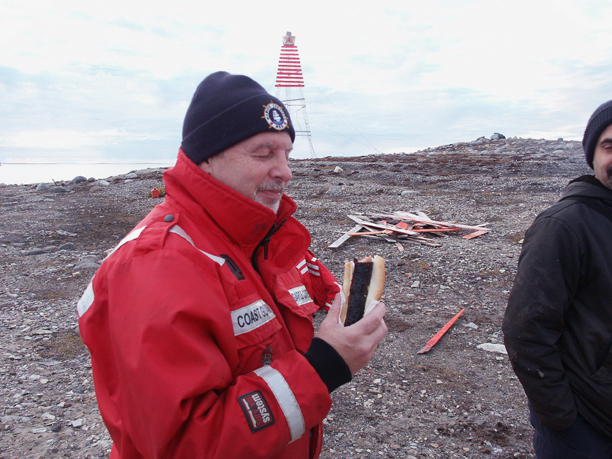 We were at Bellot Strait above the Arctic Circle and looking south at continental North America. It's good to be home where it's warm again and pick the tomatoes out of the garden. We did lift the stern of a 50 foot sailboat that had lost all its propeller blades and bent the rudder in the ice. It took five people to carry the rudder down to the engine room Our boys did all this work with the boat hanging over the water in minus 3 degree temps (centigrade, we are metric) and 25 knot winds. They had to pull the shaft and re machine it for the spare prop. We did this all for free. It took a day to free the power boat from the piece of ice it was on top of. 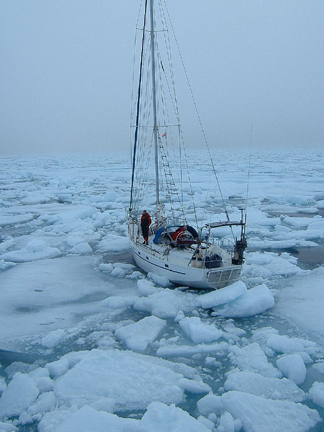 One of the sailboats was from California trying to make the northwest passage trip was a fiberglass hull, a poor choice for ice conditions. 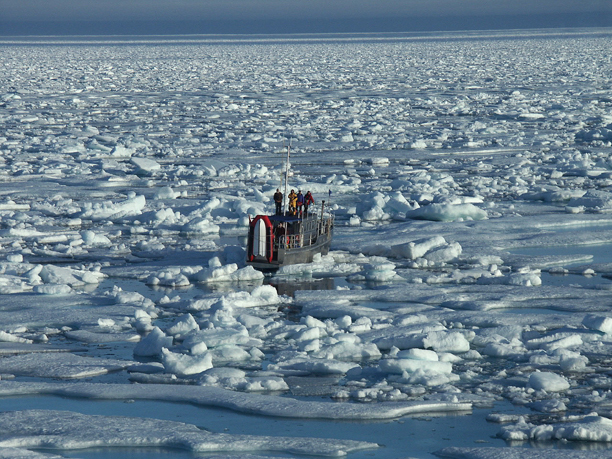 We can go 6 knots through 5 - 6 feet of ice. The ice flows move rather rapidly. the boats anchored in a sheltered bay with no ice for miles and awoke to be surrounded. 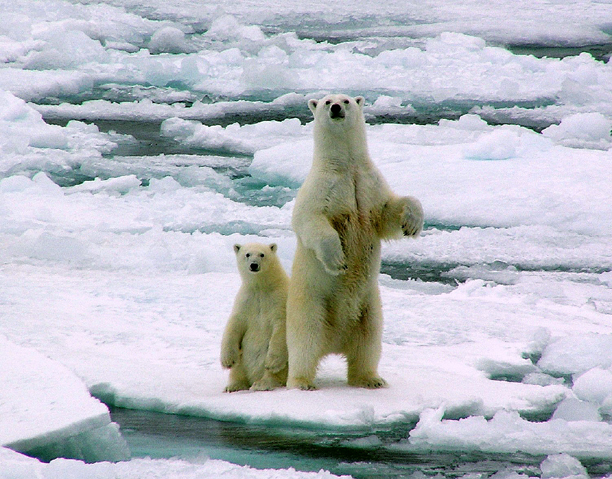 The Norwegian boat had a polar bear try to board their boat to get one of their dogs but they managed to fend it off. 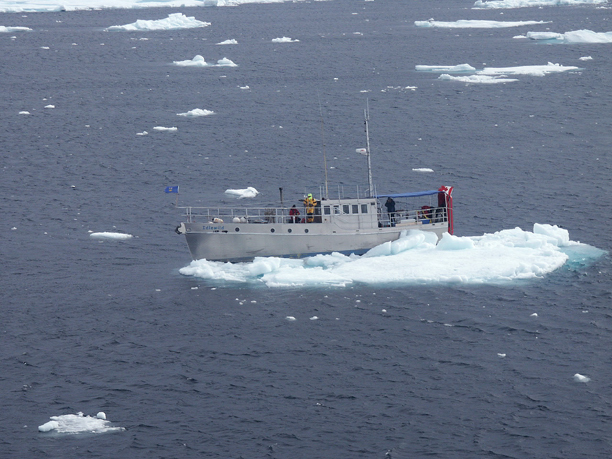 That boat has been in the Arctic for 2 1/2 years trying to make the passage only to fail. Only about a hundred boats have succeeded. 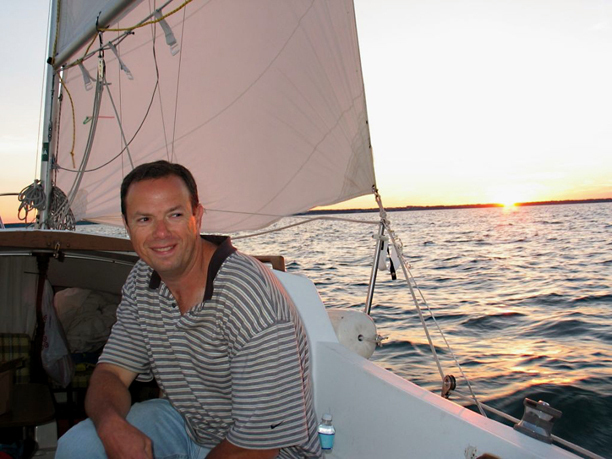 After buying a small summer home on Cape Cod in 1991, my wife Teri and I decided to buy a sail boat and expand our summer activities during our time there and away from being landlocked in Keene, NH. At the time, it was a large investment that was debated between us until the sudden death of a friend prompted a change in our thinking and ”Carpe Diem” was purchased and aptly named. 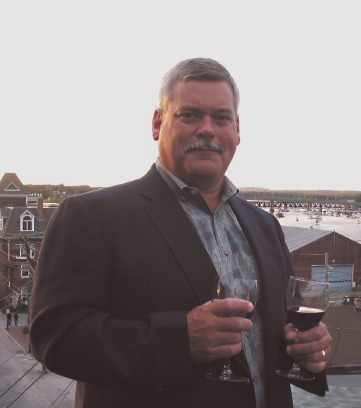 I retired from the Police Department in Keene in 98’ and we bought a house in Nahant where we can have more access to the water and Boston. I enjoy the 22 list and learn much from it. Teri and I have three wonderful daughters (all out of the house) and as many grandbabies. We’ve been married for 18 years. (second marriage for both). Teri has her own management consulting company and I manage the house. Now, at 51, I hope to have many years of good sailing ahead. 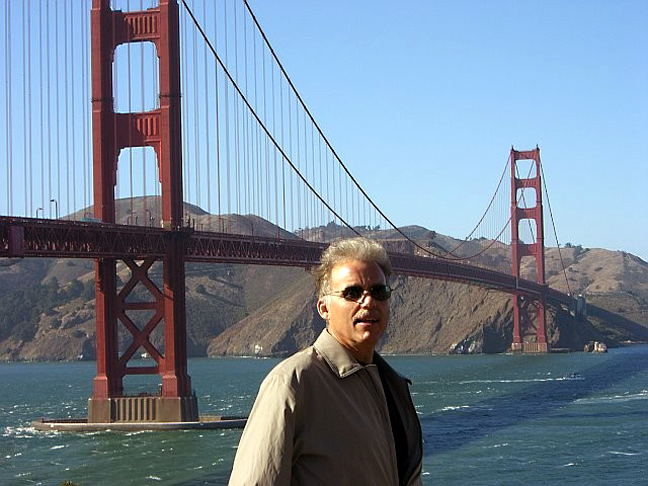 As a youngster my first acquaintance with salt water and boats began in the '60s while fishing from the Municipal pier at Redwood City, a deep-water port on South San Francisco Bay. I would dream of sailing one of the many boats heading out of the harbor. In my teens I became involved in the local Sea Scout ship “Challenger.” My passion for things nautical was immediate. “Challenger” was a 26’ self-bailing surf boat with a Sliding Gunter rig. I sailed regularly on her, a Blue Jay and El Toros. Our primary (power) vessel the 65’ “Warden Johnston” was the retired Alcatraz Prison Ferry. Aboard her I learned the ways of a sailor on the Bay and Pacific Coast through my high school years. After graduation, with a desire to travel I joined the Navy. While stationed in Virginia, I made five Atlantic crossings visiting 13 countries in the Mediterranean and Caribbean aboard the “USS Butte,” and continued to sail in small boats. After returning home I purchased a 16’ Hobie, my yacht of the next 20 years. Recently in my middle age, I’ve added a Sunfish and the Catalina to my boat yard. 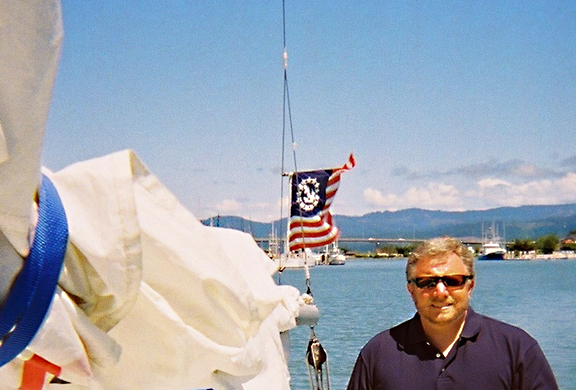 My sailing days now are on our mountain lakes, with trips to San Francisco Bay with my wife of 20 years Kris, and my teenage daughter and son. When I can’t sail I’m a fireman in the Sierra foothills of Northern California. At 57, both my wife and I are new to sailing. Two years ago, a friend asked if I would join him for some sailing in Galveston Bay on a boat he was considering for purchase. Although I was a little apprehensive, since I had never been near a sailboat, I agreed. The day was beautiful with a light breeze. As the wind began to pick up, the more exciting it got. I was hooked. 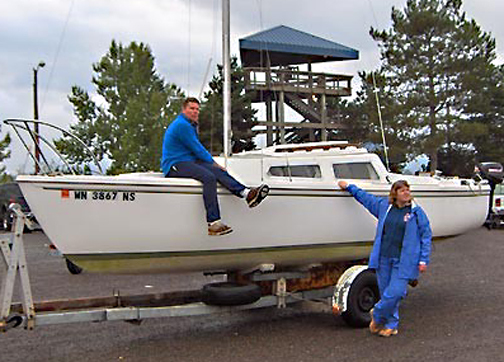 Six months later, my wife and I took ASA Basic Sailboat lessons and began the search for our own vessel. We found and bought her just two weeks ago in the Dallas area on a local lake. The same day, our new granddaughter, Addilyn Grace, was born. 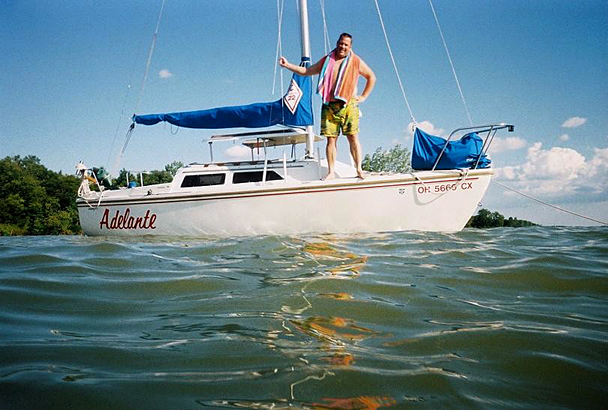 So, we’ve named our sailboat “Li’l Addie”. Our goal is to keep her on Lake Conroe for a year or so while we improve our sailing skills, then move her to Kemah and sail the bay, maybe take a cruise south on the ICW. Some of the locals say that my 22’ is too small to sail in the bay. I don’t believe that for a minute. Beth and I have six children and seven grandchildren between us. They can’t wait to visit and climb aboard “Li’l Addie”. I know when they do, they too will be hooked. 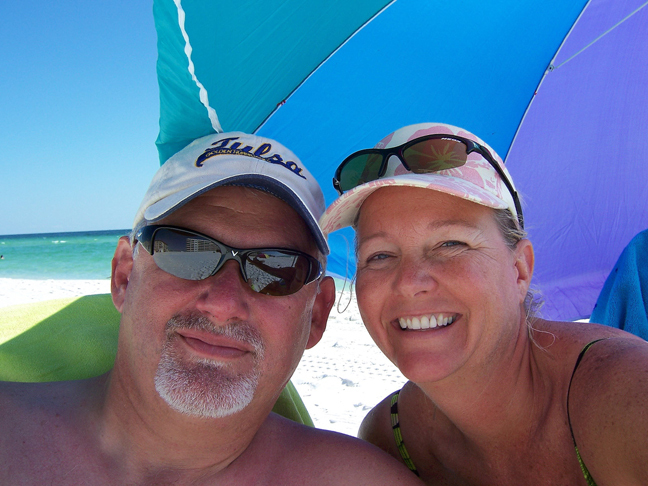 Beth and I have been married for 10 years and enjoy our time spent together. I’m self-employed while Beth works for a major financial institution. We both work out of our home. 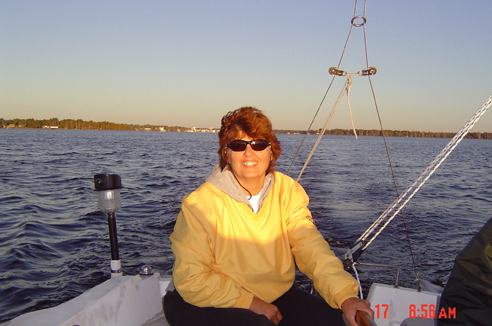 Beth enjoys quilting, sailing and spending time with the grandkids. Besides sailing, I spend time playing my five-string banjo and dobro. I also do some storytelling from time to time. We’re both very active in our local church group. 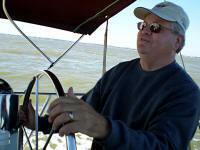 My picture was taken during that first sail on Galveston Bay. As a newcomer, I know I’ll have many questions for the group and look forward to a long relationship. I was lucky enough you live on a lake growing up in northern Connecticut. I had a friend that had access to a sail boat and we learned to sail at 8-years old. We had to sail together to have enough weighed to keep the boat upright. 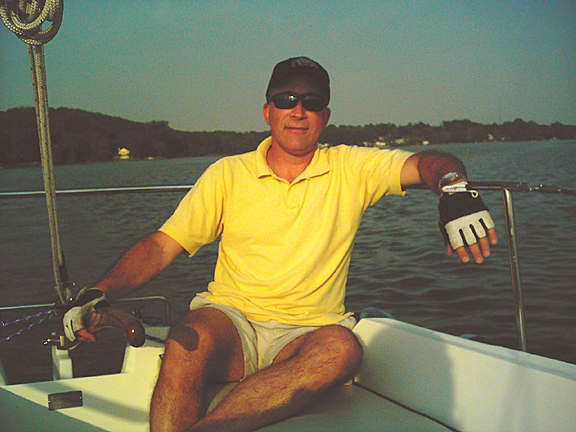 When I was 14, I made a deal with my Dad: if I came up with half the money for a boat, he would supply the other half. I worked on a tobacco farm near our home, 48 hours a week, and earned the $400 I needed. My first boat was a new MFG Sidewinder, 16-foot, main and jib with roller furling. I sailed for years all over the coast of Rhode Island and Fishers Island Sound and it was a great learning experience. I had the boat with me in Florida when I first went to college and for a number of years after that. I had about a 15-year gap without a boat while I lived in Denver and Chicago areas. I bought my C-22 in May of 2003 in Michigan and sailed out of the Waukegan Harbor Marina in Illinois for 2 years. I have made a lot of improvements and upgrades to “La Voile” in the past 3 years. 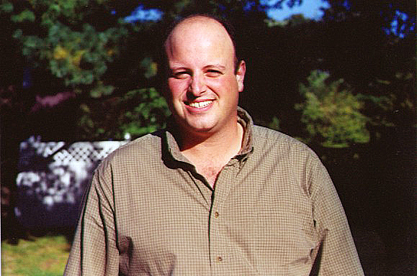 I moved to New Hampshire in June of 2004 but did not get into the water due to the move and a motor that died on me. In 2005, with a new Honda motor, we are sailing out of the Sunset Marina in South Portland Maine. 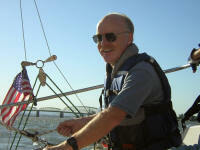 I am enjoying sailing in Casco Bay and the Atlantic, exploring the many islands along the Maine coast. 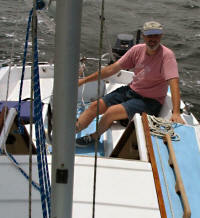 About three months ago my friend Kim invited me to go sailing on a friend’s Thistle. I hadn’t been on a sailboat since I owned a Laser. I was hooked. Then we went on another friend’s Catalina 25 and the hook was set. I found a 1980 C22 swing keel on Craigslist and ended up buying it for a mere $2,100. It was sail ready when we got it and we’ve added a few additions: there is never a lack of things to upgrade. “Wind Player” is resting comfortably at our Lake Travis Marina. She looks so much happier now than when we found her. Hey to all the central Texas sailors, please give us a shout if you see us out. We bought our '81 Catalina 22 in late March of 2005 from a seller on eBay. It needs a bit of TLC and sprucing up, but we did get it out on the lake and sail her the first weekend. I’ve been sailing off and on since age six when my dad built two little gaff-rigged sailboats for my older brother and me, which we sailed on the Mississippi gulf coast at Ocean Springs. I spent a couple of years racing Thistles at the local sailing club, and I’ve had some powerboat experience on the gulf coast and along the Intracoastal Waterway, thanks to a rich uncle! 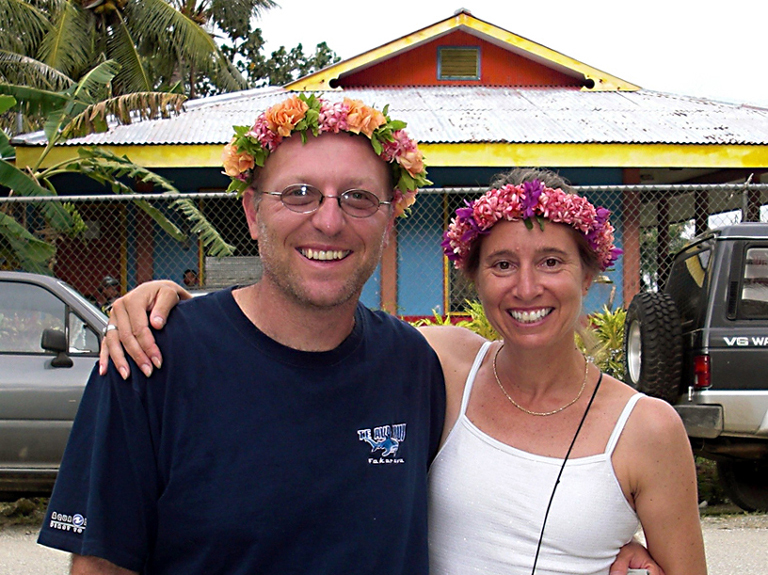 Before we met in 2003, Jennifer and her first husband had owned a 26' McGregor for a few years - aptly named the “Ibobalot.” We've since chartered a 32’ Catalina together and spent a week sailing the west coast of Florida and Tampa Bay. 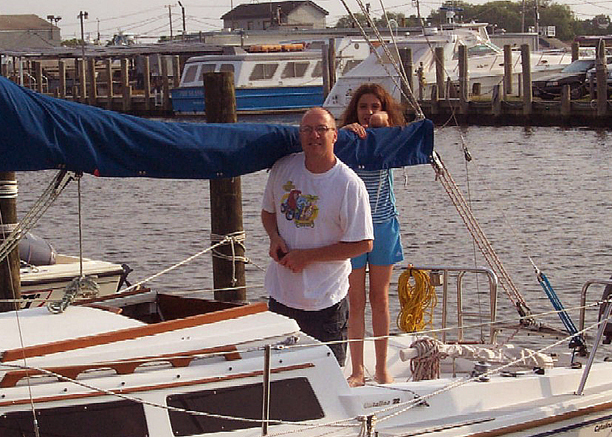 Our plans are to sell the house and move aboard a sailboat in three years after Jen’s son goes off to college. Jen, 46, is a retired Army Lt. Colonel working for ROTC at a local university, and I’m a 52-year old computer programmer/software developer and general tech support flunkie. 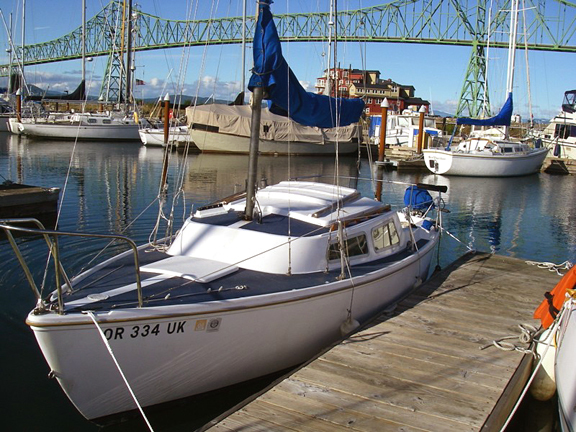 Our Catalina 22 will be our sailboat until we're ready to make the move up to a liveaboard. We’ll probably continue to charter bigger boats from time to time when the urge becomes too great to ignore. I joined the Navy after high school, got edumacated and traveled the world. The first time I went sailing was in 1975 with a friend in Monterey Bay, CA aboard a day sailor (think it was a Capri 22). After that experience, figured that someday I would own a sailboat. 22 years and nine duty stations later, while still in the Navy and stationed in Augusta, GA on my twilight tour, the opportunity availed itself. 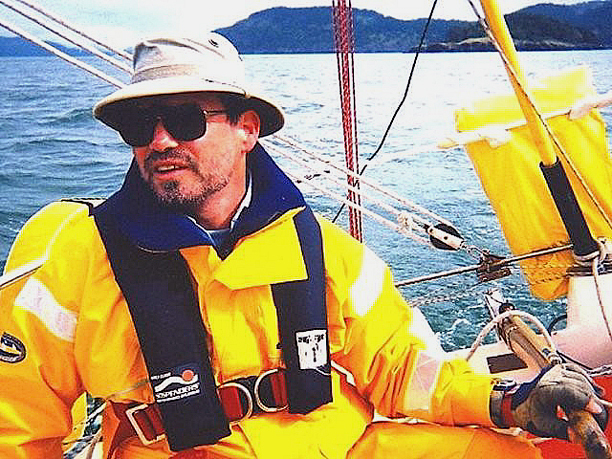 At the time, I was crewing on a friend’s Seafarer 23 – this only added to my desire to own a sailboat. I purchased my Catalina 22 from an elderly gent who was in the market for a bigger boat. Sailing on Lake Thurman was a blast, with its 70,000 acres of water and plenty of gunkhole inlets – many good memories were gained there. A year later, upon retiring from the Navy and moving into work as a sandcrab in Ohio, I made the decision that my C22 was moving with me. I bought a trailer in Atlanta and migrated north to central Ohio in the summer of ’98. Sailing in central Ohio isn’t nearly as nice as Georgia. Buckeye Lake is okay though, with only 3,000 acres of water – but its only twenty minutes from home. Hopefully, at some point in the future, I’ll set my sites on returning to the south for year-round sailing. My boat is named Liberty Pass because I wanted to keep it nautical and personally meaningful. A liberty pass to a sailor is a pass to get out and enjoy the liberty of doing what you want to do. For what its worth, I consider myself more of a cruiser than a racer. Bottom line is that I really enjoy sailing my C22! I was born in Maryland, raised mostly in New Jersey, lived two years in Houston, TX, went to Clemson University in SC, then the Boston Architectural Center. I've lived around Boston for almost 8 years, then Chattanooga since 1977. I'm an independent architect, introduced to sailing in 4th grade. 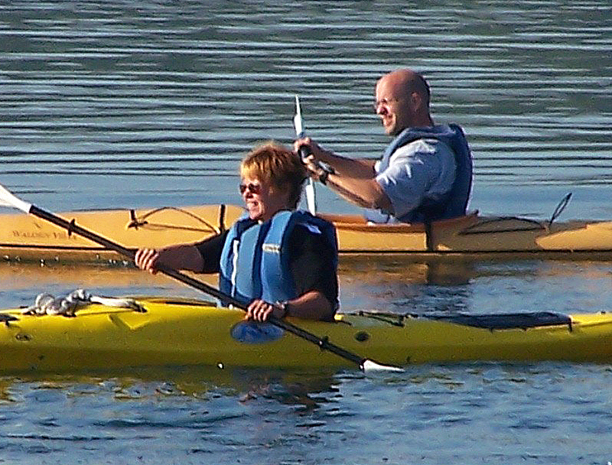 We used to play a game called sponge tag with 10–13 foot dinghies on Pines Lake in NJ. Throw a big sponge and hit another player’s boat. They’d have to swing around, retrieve the sponge and give chase. I was always amazed at how more experienced sailors, even in the 4th grade, could sail away from me. But I got away from sailing for a long time. I did some hang-gliding in New England; flew off Mt. Kearsage (NH) many times – my favorite mountain. I also flew off Ascutney and Stowe (VT), and once even Mount Washington. In Chattanooga area, I flew off several more, but gave that up and bought a 1960 vintage Snipe in ‘85. Now we mostly sail our Catalina 22 on Lake Chickamauga. Shown at left, son David, wife Barbara, and Peter Snyder. Daughters Sarah & Kathy are not shown. I am currently helping Dieter Lange to prepare a Catalina 22 for the water. He bought the boat months ago from someone who imported it from the States. The boat is sitting on its trailer (Trail and Sail - also from USA) at Dieter's property on the Swartvlei which is a lake on "The Garden Route"; a coastal strip which forms part of the Western Province of South Africa. The location is between the towns of George and Knysna. 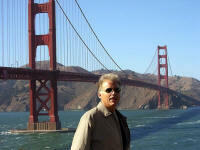 I'm 69 and retired from a career in civil engineering in the UK and here in RSA. 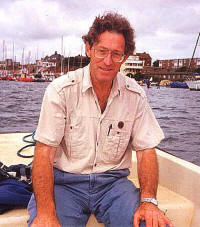 I was taught to sail at the age of six and my mother had a boatyard at Shoreham on England's South coast. Together with my brother and our sailing dinghy, "Two Brothers," I spent all out holidays from boarding school "messing about," not just in our boats at the yard, but other people's boats also. 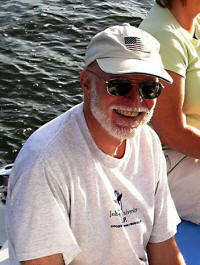 Boats and boating have been more than an interest and have provided me with much pleasure over the years. 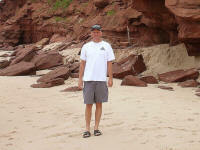 Dieter's business in Johannesburg; he comes down to the coast as often as he can. My function is to keep an eye on his holiday house (where the Catalina is) and to help him get his new purchase into a seaworthy condition. 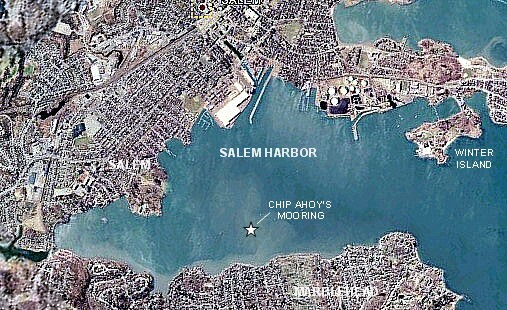 I grew up in Salem, MA and learned to sail in Salem Harbor. I graduated from Salem High, joined the Navy (submarine force), and I have been all over the world as well as under every ocean. I have sailed Puget Sound, various locks of Scotland, and t he Georgia coast. My last duty station brought me to Kings Bay, GA. I retired here per orders from the Admiral (I promised her that since I dragged her every were in the world, she could pick the place of retirement.) She chose St. Mary’s, GA. I came across my C22 in December of 2003. After a year’s work (which is not done) I will put her in the water next month and start sailing my own boat. Currently I work for Lockheed Martin, have been married going on 23 years, and have two boys, one in college the other in high school. Born in '56, I own a computer repair business and my boat is my release from computers, people and all the other annoying things in life. I have a wonderful wife and two grown up kids. Luckily, my wife kind of likes sailing as long as the boat isn’t healed over too far! I got my pride and joy last year from my uncle who let the boat just sit for way too long and used the wrong parts to fix it. It was sitting with the bow up in the air full of rain water from the winter when I bailed out at least a hundred gallons and towed it home for the first year of restoration. The good thing was it held water so I wasn’t afraid it would sink when launched. It's my first sailing boat and I'm finding out that it's a lot different being the owner instead of just the crew! (Say goodbye to my wallet!) Respite has been in my family for about 15 years. I've been sailing on and off for about 10 years. Our home base is on the VERY beautiful southern Oregon coast. 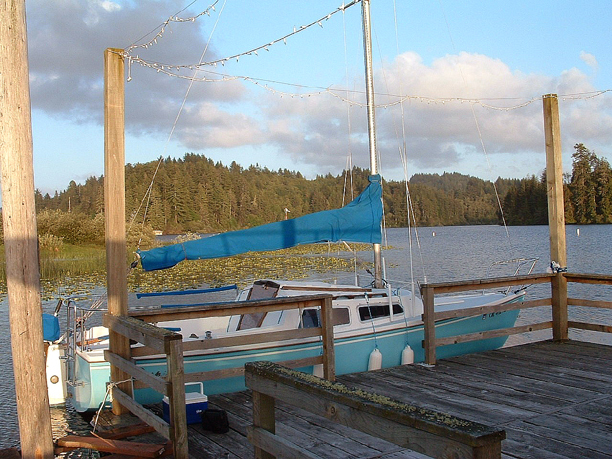 I'm learning how to sail this boat on a nearby lake in Lakeside this year (the trout and bass fishing is pretty good there as well) and will be in Coos Bay and the ocean next year. Steve and I live on Long Island and sail the Great South Bay. We are married 25 years and have two sons. 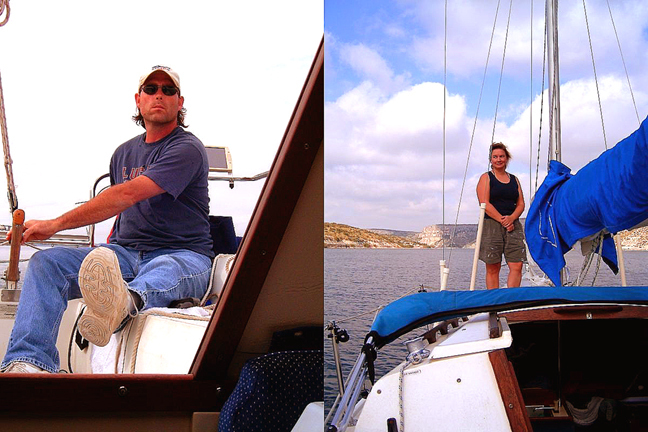 We bought our boat in 1992 and have been sailing together ever since. Steve is a banker and I am a respiratory therapist. We are members of Wet Pants Sailing Association and Steve is an avid chef. If you need someone to help with a 300 person Clam Bake, he’s the man. Our crew has grown up and we are attempting to rig for single-handling this season. Our son Mark will be doing the upgrades. Mark is an engineering major and also sails. This is a big plus since Steve is power-tool challenged! Mom can’t wait for the new roller-furling system because I do all the foredeck work. I took the plunge and bought my Catalina in March 2004 and spent my first season getting to know my new hobby. I am still on the early "painful" part of the learning curve with my only sailing experience being a few trips on a small sailing dingy as a teenager. My wife Julie and I have been happily married 12 years and we have been blessed with four future deck hands: Devin, Jacob, and the twins Liam and Daniel. The boat name is partially inspired by a famous Samuel Clemens quote: "... Sail away from the safe harbor. Catch the trade winds in your sails. Explore. Dream. Discover." This aptly describes the spirit of this whole sailing adventure. In my first year sailing I learned three things: 1) My favourite time to sail is just before dawn (the kids are asleep, the lake is still, and the winds are forgiving; 2) Make sure your hatch is pushed back when you step your mast (see website), and; 3) The best time to tell your wife you're buying a sailboat is before you bring it home! I was born in California in 1956, lived all over the state then family moved to Iowa in about 1968. First sailed a sun fish on Little Mud Hen Lake in Wisconsin about 1970 or so. Joined the Navy in 1975 as a parachute rigger (Aircrew Survival Equipment) and learned to sail in the late 80's in Long Beach. 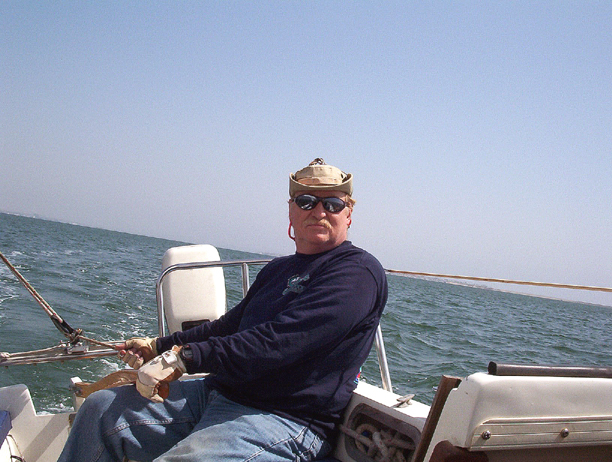 I raced a bit on Coronado 15's, Catalina 27's and various yacht club boats and did the Newport to Ensenada and the Oakland to Catalina races as well as a few shorter ones on the McGregor 65' that was donated to Long Beach Naval Station Sailing Facility where I worked part time as a sail and canvas repair tech and occasionally taught basic and intermediate sailing classes. I retired from the Navy in '95, met and married Gabrielle in '98 in 2002 we got Carli as a foster child and adoption was final for her last month (March of '07). Since retiring from the Navy I have worked as a psych tech, locomotive maintenance tech, taxi driver, housing construction, and now stage hand and sound tech as well as the last couple of years as a substitute teacher in the county. Last year I was browsing RV's online in August and my wife said she thought we would get more use and enjoyment from a boat than a "land yacht." Less than a month later, and just in time for my 50th birthday, we acquired "Los Milagros" ( The Miracle). Our daughter claims title of First Mate 'cause she was the first one on the boat (besides me) when I brought it home. I guess since I was bequeathed with the handle "Captain-Bob" years back that Gabrielle must be the Admiral. “Woody” to most of my friends, I came to sailing through windsurfing. I found it hard to share my passion for high wind boardsailing with my family. A C22 is the perfect way to get everyone on the water. I also ski, teach at Mt. Hood, Oregon, and work for Vancouver Fire and Rescue in (as the mayor likes to say) “Americas Vancouver” in Washington. 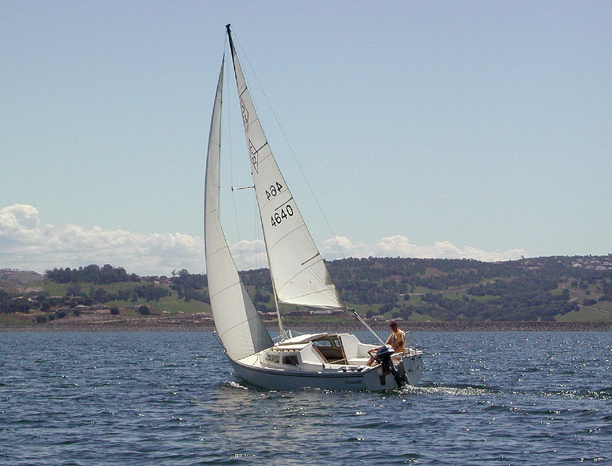 Years ago I had the opportunity to sail with a friend who owned a Catalina 22 in our Humboldt Bay. It was an incredible time each time we went out and I fell in love with sailing. But life happens and after a short while I stopped sailing. 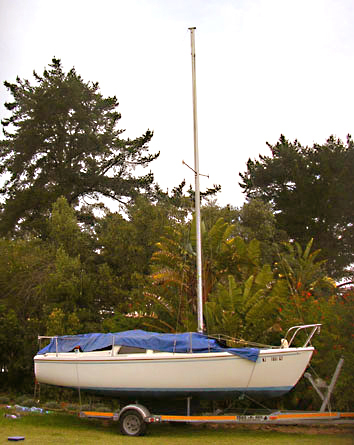 Almost twenty years later I finally made the jump and bought my own Catalina 22, “Dao,” took lessons and now sail our Humboldt Bay again. It is great. On a summer evening after work I can run down to the marina, head out onto the boat and sail for a couple of hours letting the cares of the day wash away. Join our friendly group of more than 280 Catalina 22 owners and growing!